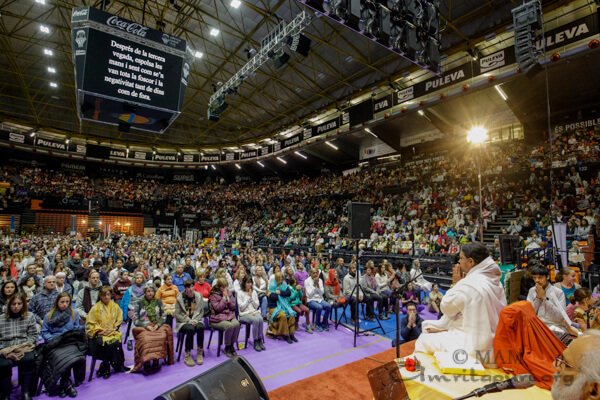 For the first time ever, Amma visited the city of Valencia, Spain and held three days of programmes there. 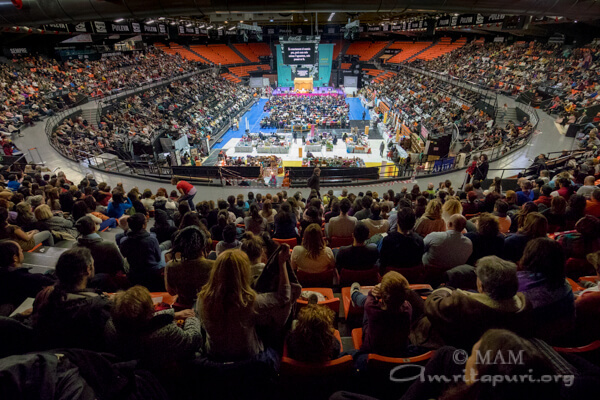 The programme venue was the famous Pavelló Municipal Font de San Lluís. 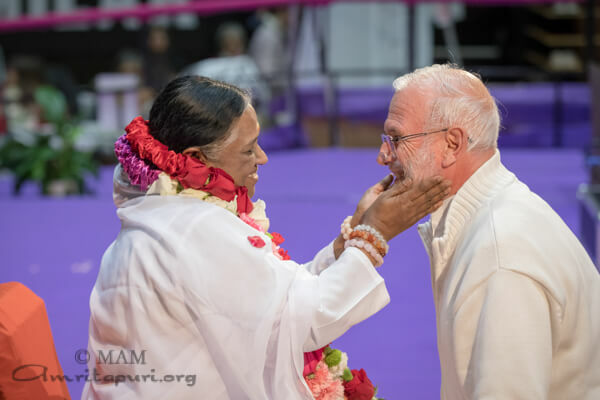 The venue saw a continuous flow of devotees and newcomers throughout all three days, with the entire stadium packed for Amma’s Atma Puja and group prayer for world peace before the Devi Bhava on the third evening. 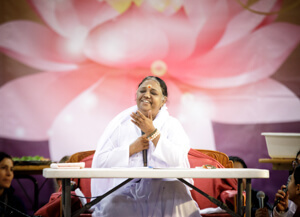 Though it was the first time Amma had come to the region, it turned out to be the biggest Devi Bhava of the entire tour. 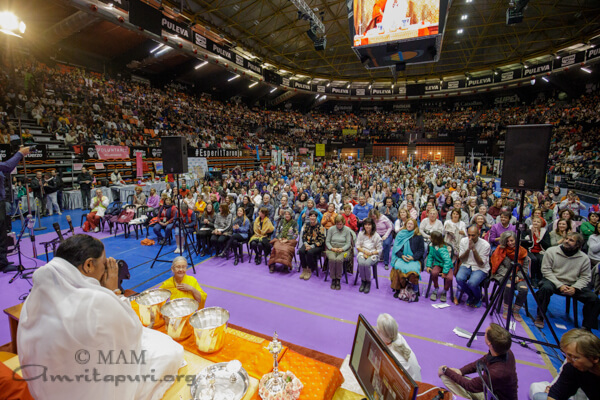 This was the 20th anniversary of Amma visiting Spain each year, and the devotees were well-prepared to celebrate the occasion. 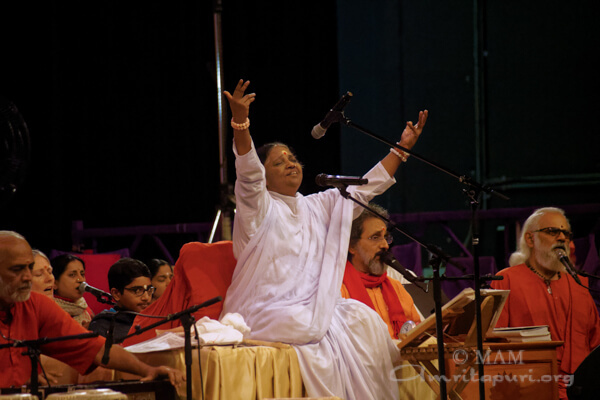 At the close of the ceremony, the entire crowd sang a song to Amma. 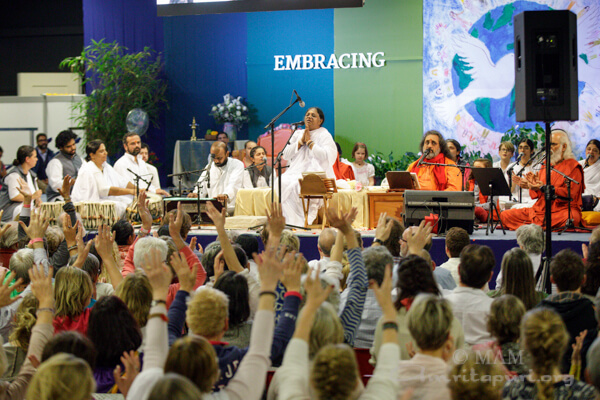 Having rehearsed together before Amma arrived, the crowd sang in perfect harmony, singing “Un sólo amor, un sólo corazón, Amma es la inspiración de todas nuestras vidas…” (“One single love, one single heart, Amma is the inspiration of all of our lives.”) Simultaneously, the crowd released a beautiful tapestry of multi-colored heart-shaped balloons to accompany their hymn to Amma and raised their hands from row to row throughout the stadium, creating a human wave of love and gratitude for Amma. 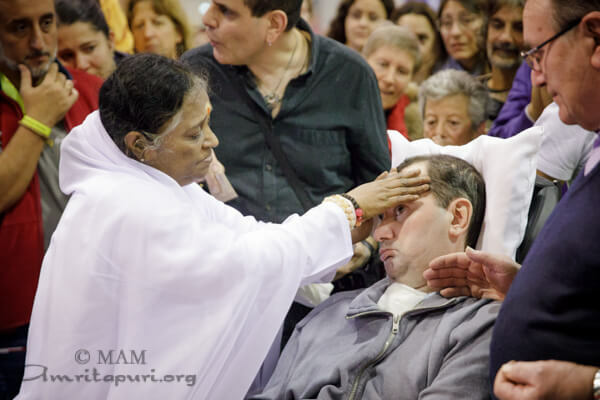 Amma’s teachings saw a beautiful manifestation in a very special care package she received. 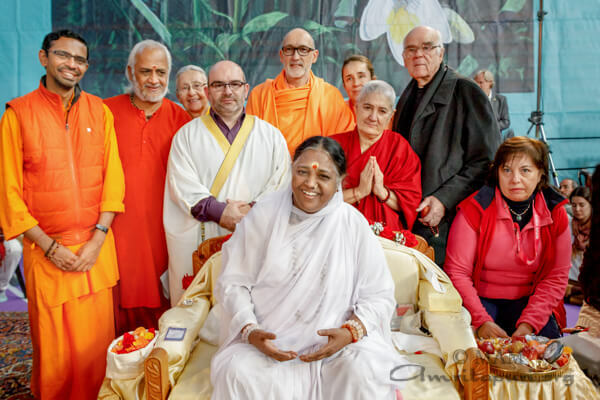 For the past few years, during Amma’s visits to Granollers, Spain, a group of prisoners who have been studying Amma’s teachings and practicing the IAM Meditation Technique, as well as carrying out service activities and raising funds for local charity groups, spends a day at the program doing seva and comes to Amma for her darshan as well. 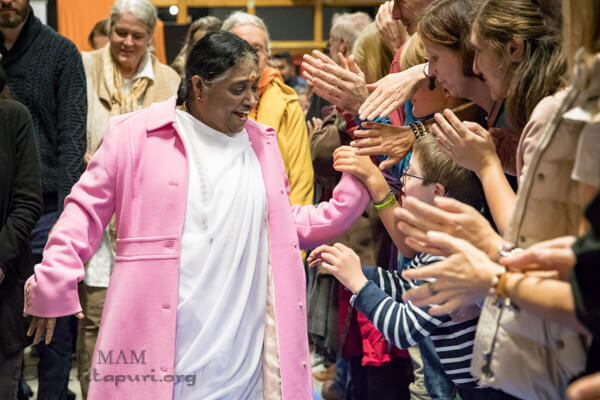 Every year, they have brought gifts for Amma that they have made themselves to express what Amma means to them. 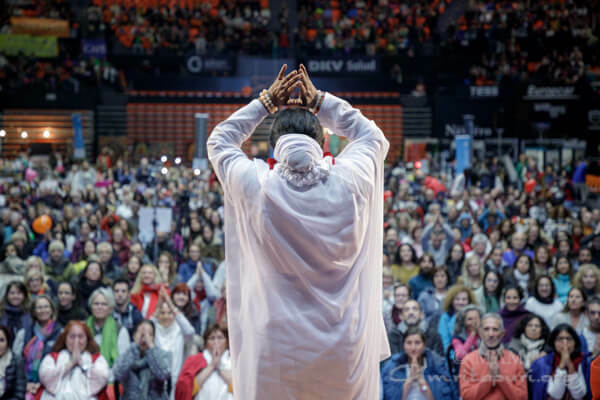 This year, as Amma came to Valencia, they were not able to attend the program, as it is outside the area where they are permitted to travel. 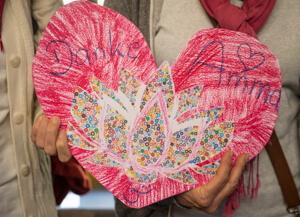 Instead, they sent presents with the volunteers who work with them in the prison. 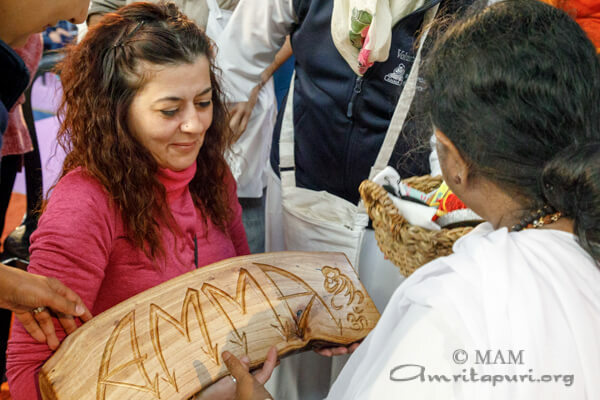 This year, they had made thread paintings and a wooden sculpture of Amma’s name, carved from wood from a fallen branch of an olive tree in Amma’s Spanish ashram. 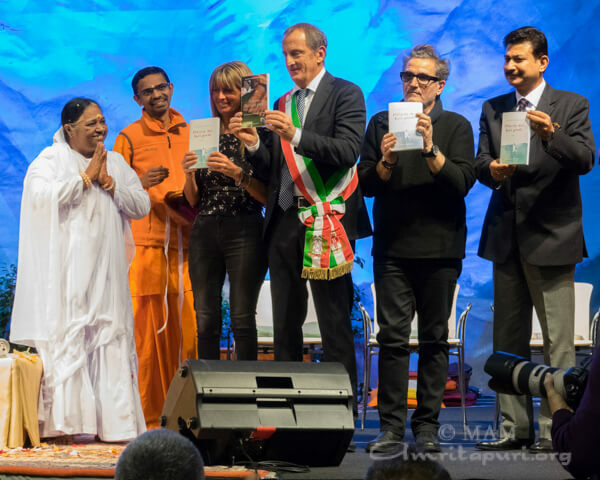 They also sent a basket of quotes of Amma that had touched their heart, from Amma’s books which they have been reading and reflecting on in prison. 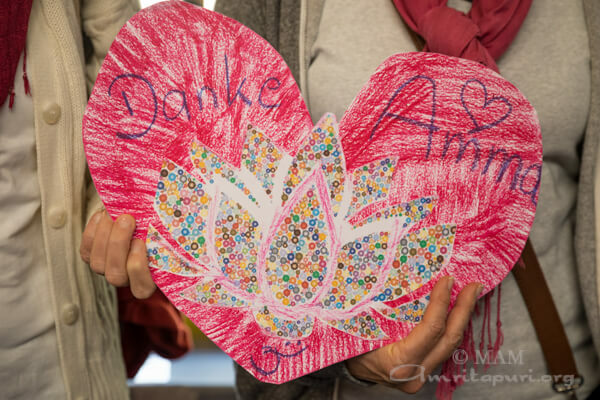 They wrote the quotes on colored pieces of paper and decorated them with flowers. 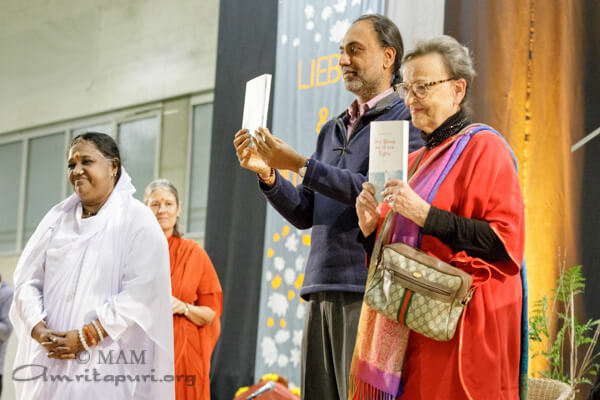 They had wanted to bring the messages to Amma to have them blessed personally, and then to distribute at Amma’s program for the devotees there. 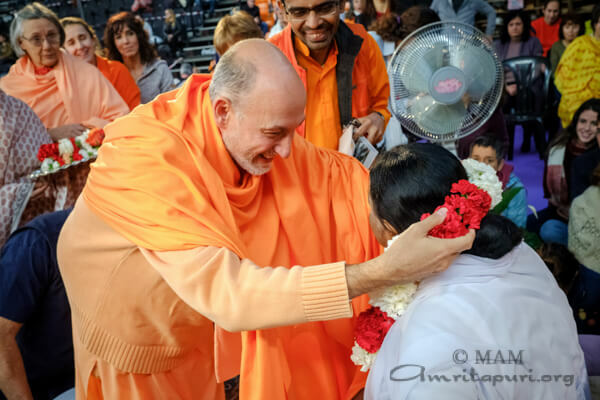 Since it was not possible for them to come, they sent the basket to Amma. 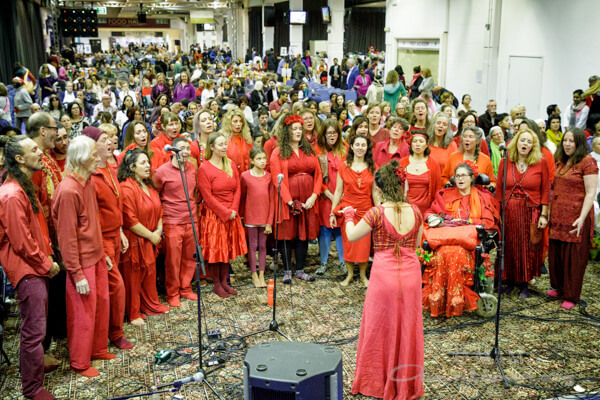 The blessed notes would be returned to the prison where they will share them with their fellow inmates, thus continuing to spread the light of love and compassion and becoming ever more aware of the hidden wealth of love within each of them. 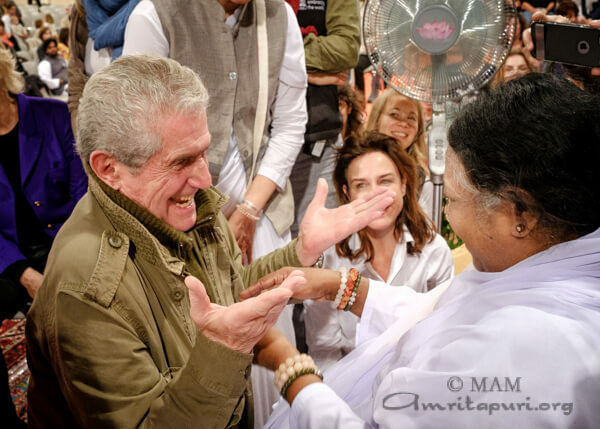 Valencia was the final stop on Amma’s 2017 European tour. 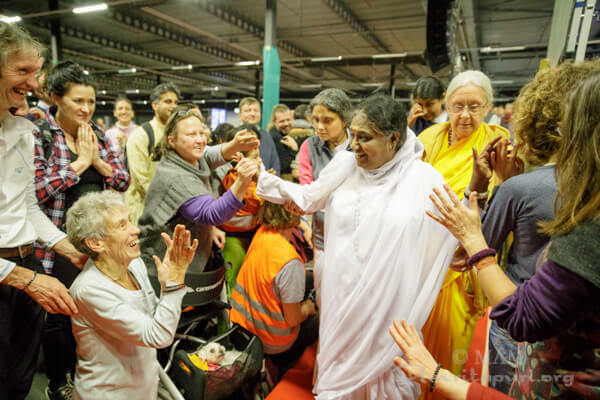 Thus the end of Devi Bhava, when Amma emerged from the temple in her white dress and gazed lovingly down at all the gathered devotees from Spain and all over the European continent, held a special poignance. 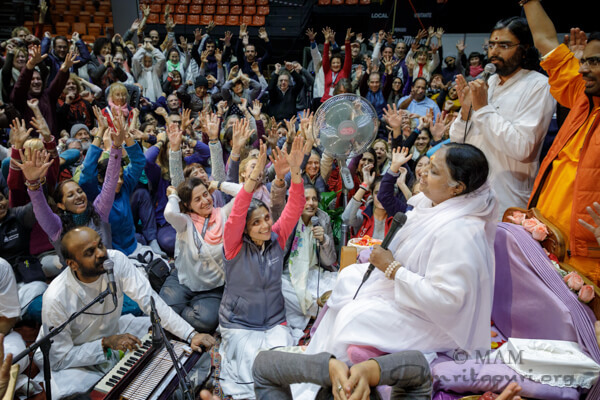 As Amma smiled softly at all her children there, one by one, they began to raise their voices in song, Spanish and non-Spanish alike, singing together, singing “Un sólo amor, un sólo corazón, Amma es la inspiración de todas nuestras vidas…” It was a sweet and beautiful coda to mark the end of Amma’s tour, and a reminder that despite the fact that Amma was physically going away, the love and inspiration she had imparted to everyone there and throughout her tour would be a guiding force in every moment of their lives, and the lives of all those with whom they share this love. 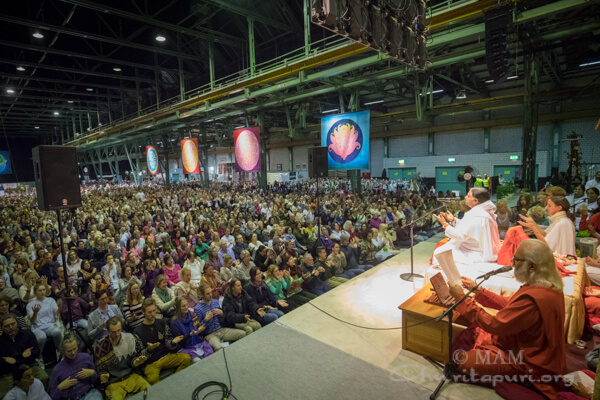 Amma’s programme in Finland was held in Helsinki at the Fat Pipe Arena. 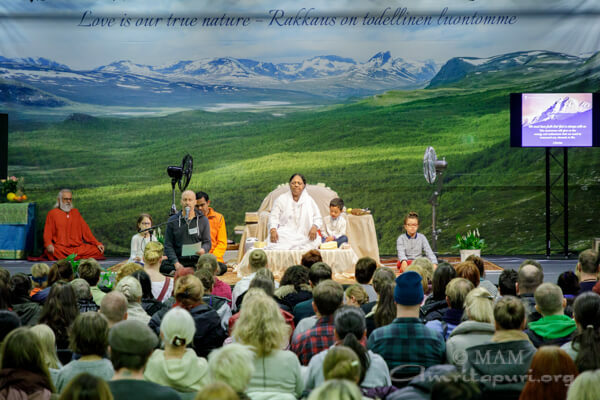 Amma’s visit was held just five days in advance of Finland’s centennial celebration of achieving its independence as a nation; filling the air with an additional layer of joy and festivity. 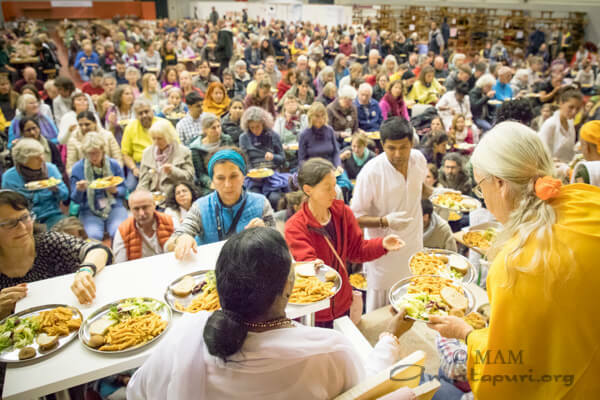 The Finnish devotees presented Amma with a cake with 100 candles to mark the special occasion, along with a prayer asking Amma to keep their country in her embrace now and forever. 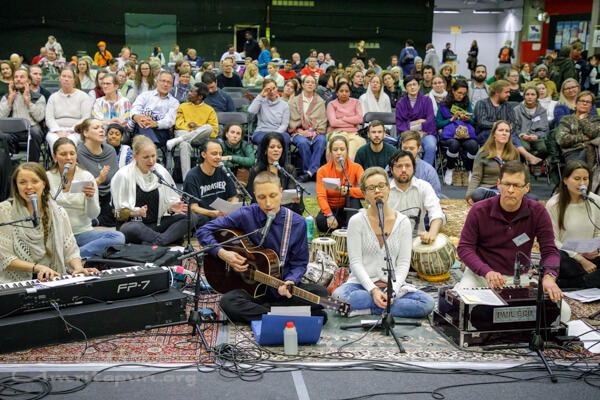 Devotees and newcomers from neighbouring countries including the other countries of Scandinavia as well as Russia and Estonia made the trip to Helsinki to receive Amma’s darshan. 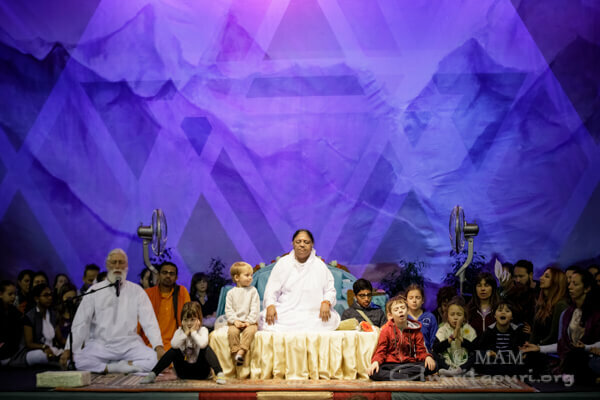 Throughout the two days of Amma’s programmes, a gentle snowfall decorated the trees and landscape, much to the delight of the international tour group travelling with Amma. 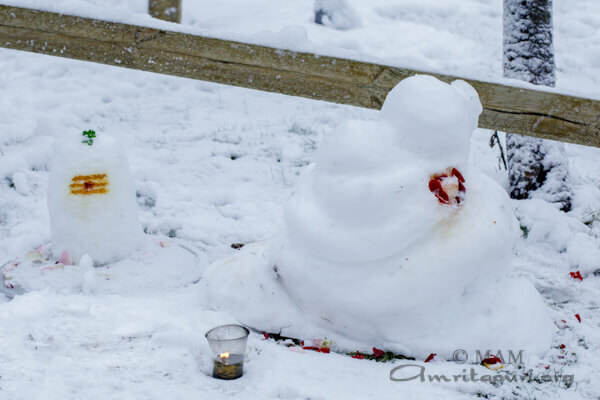 They made good use of the snow; even creating a 3-dimensional snow sculpture in the shape of the Amma logo, as well as a Shiva Lingam complete with a sculpture of the Divine bull Nandi facing the Shiva. 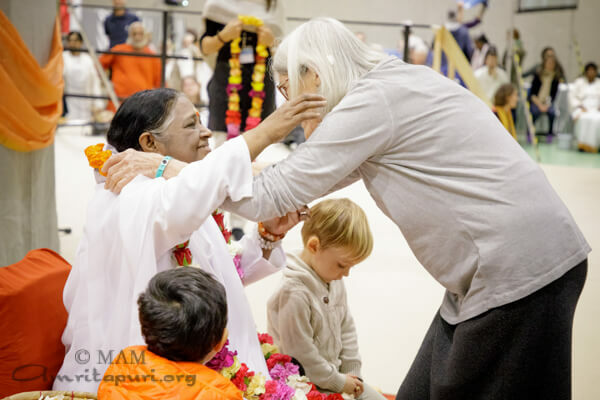 Both sculptures were much appreciated by the staff and devotees; and finally, they were brought to the stage to offer directly to Amma. 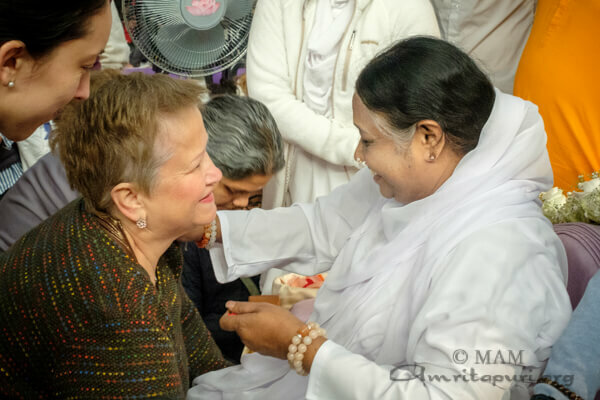 Amma spent time with the sculptures, even polishing the sculpture of Nandi to better represent his form. 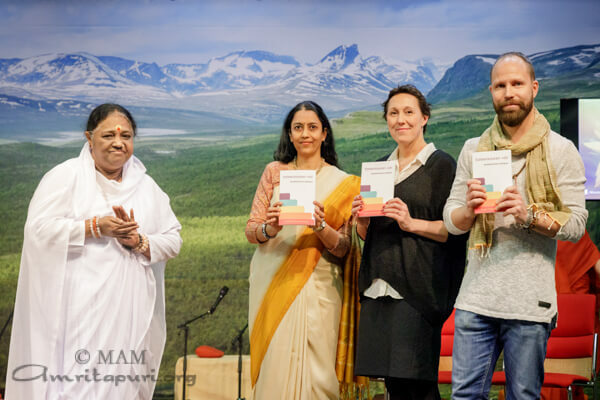 Amma was welcomed to Finland by India’s Ambassador to Finland, Ms. Vani Rao, as well as Mr. Tunna Milanoff, the acclaimed filmmaker and writer. 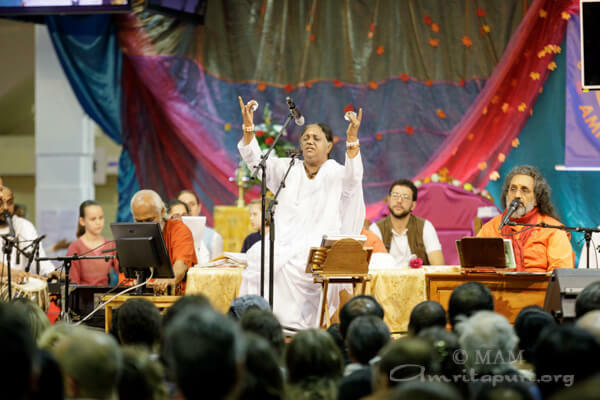 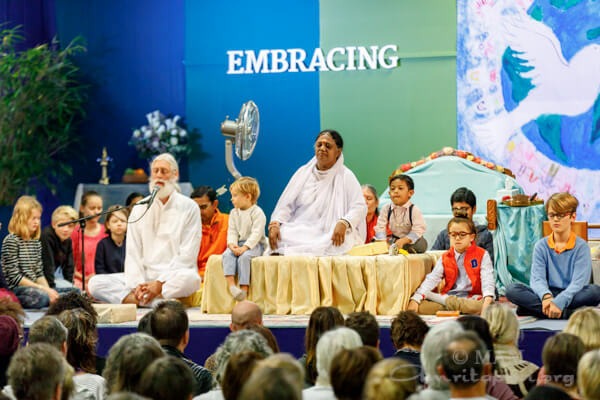 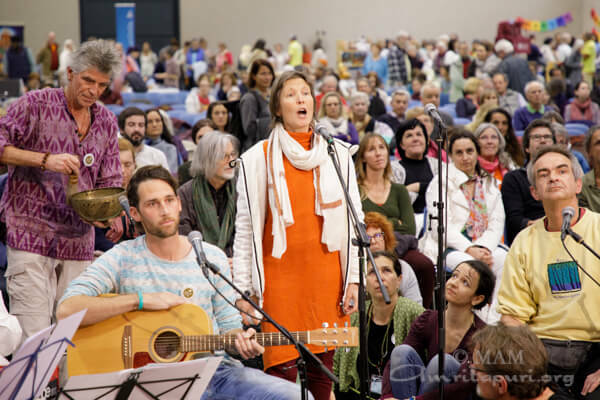 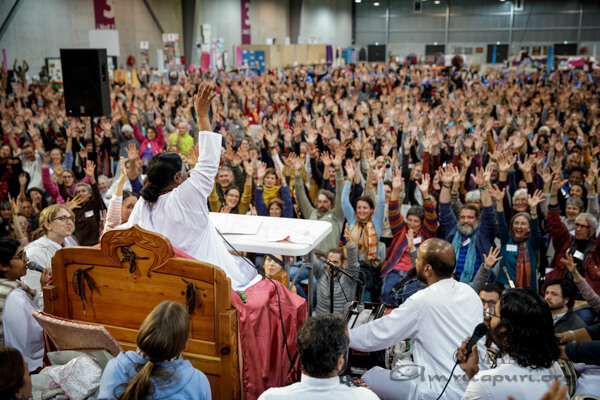 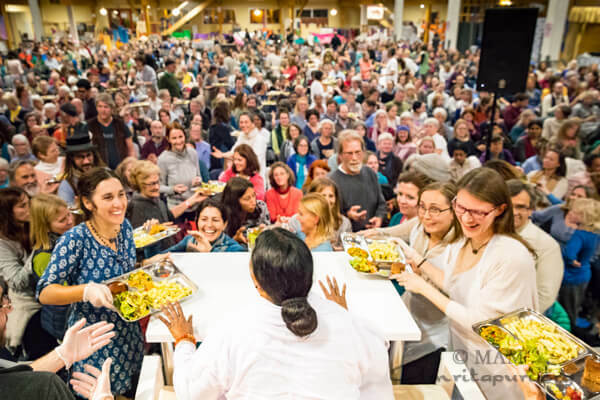 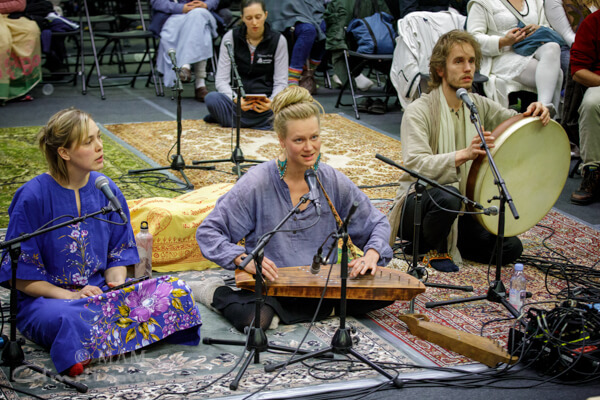 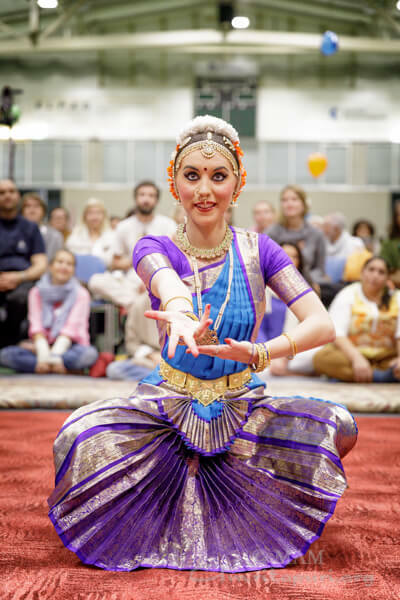 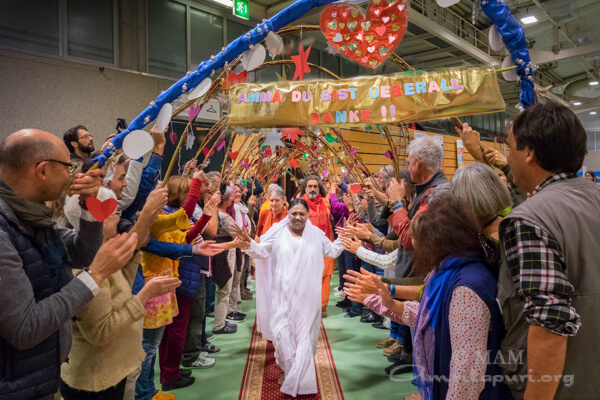 Despite being held mid-week this year, the Expo Houten event center was again filled to overflowing by devotees and newcomers coming to receive Amma’s embrace, listen to her satsang and bhajans, and pray together for the peace of the whole world. 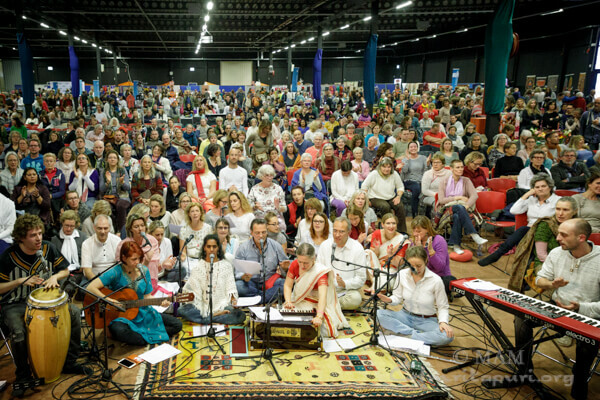 Devotees came from all over the region, including Belgium, Luxembourg, throughout the Netherlands and further afield. 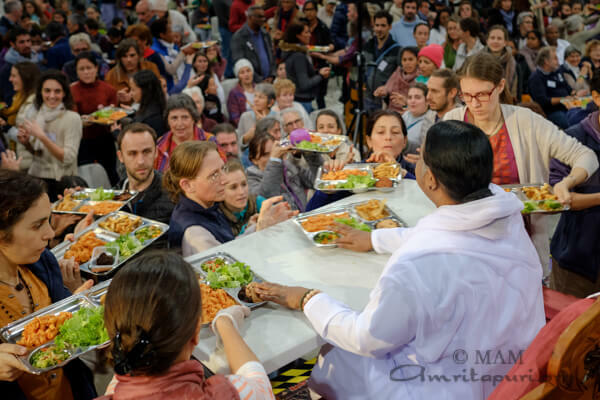 Upon her arrival from Chalons-en-Champagne the evening before, Amma served a Prasad meal to the volunteers, held a Q and A session and led everyone in bhajans and meditation. 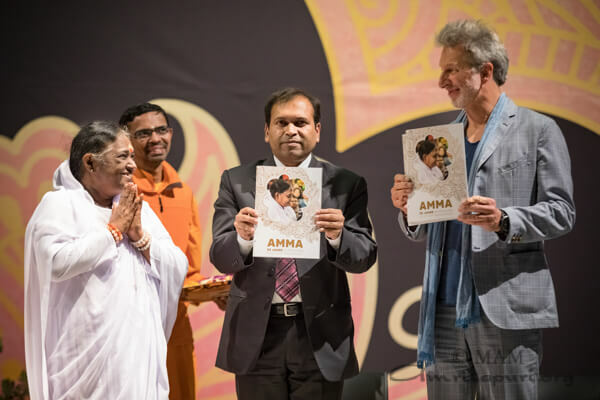 Amma was welcomed to the Netherlands by India’s Ambassador to the Netherlands, Mr. Venu Rajamony, as well as by VU Professor J. Heringa, and by world champion boxer and kick boxer, and acclaimed Hollywood actress Lucia Rijker. 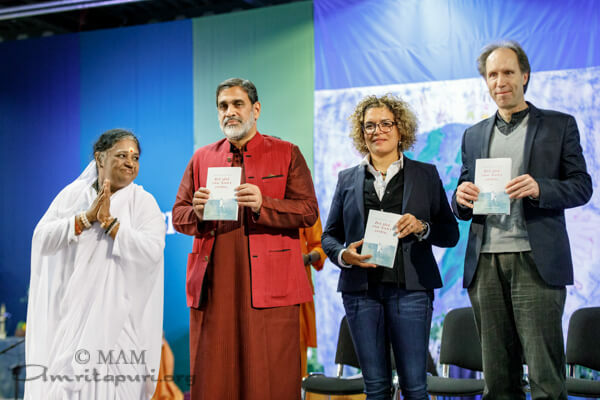 In his remarks, VU Professor Heringa said, “All scientists whom I’ve been in contact with at Amrita University, really take their inspiration directly from Amma. 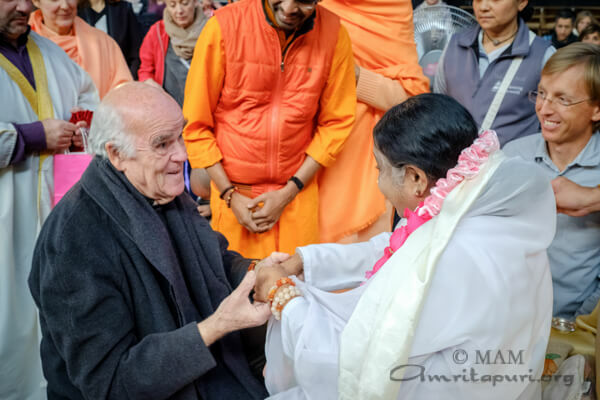 When Amma meets a head of a department at Amrita University, she asks him or her: ‘What have you done this week to make the world a better place?’ So that they know very precisely where they heading, and in which way they really try to better this world. 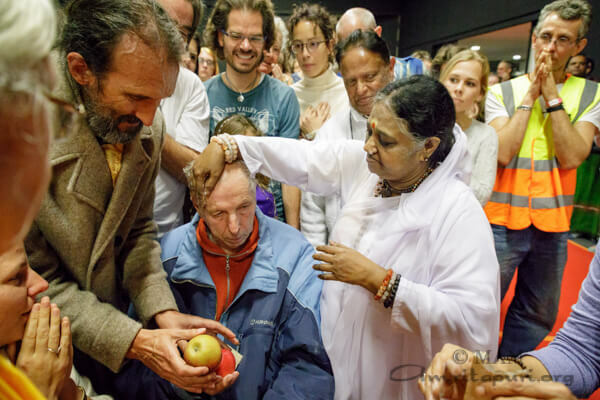 So it is not science just for the sake of science. 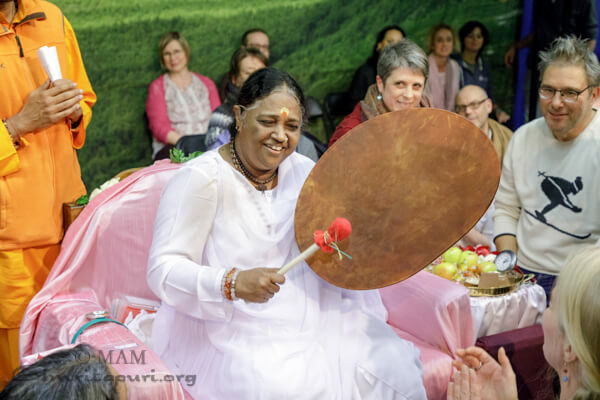 For the first time, Amma visited Châlons-en-Champagne, France. 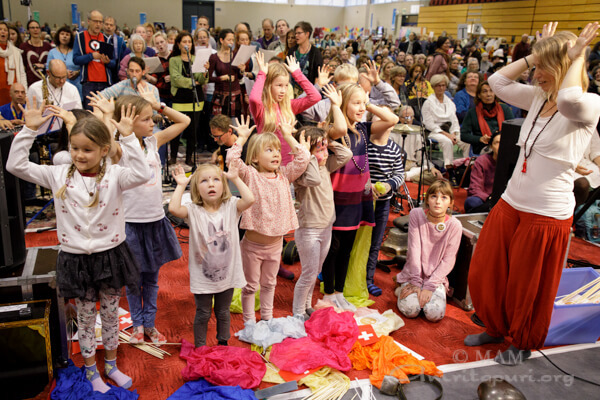 Her three days of programs were held at the Le Capitole arena. 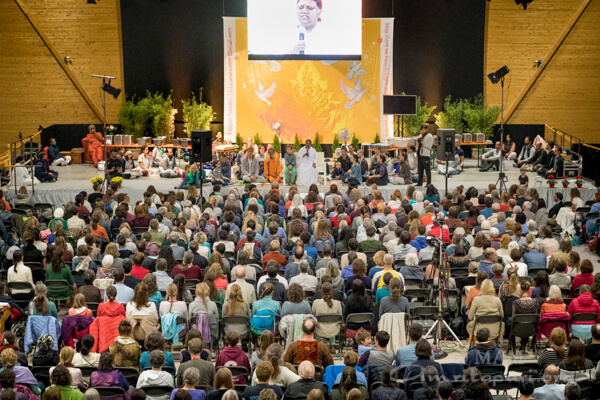 The sprawling arena was filled with devotees who had gathered with great enthusiasm to celebrate Amma’s 30th year of visiting France. 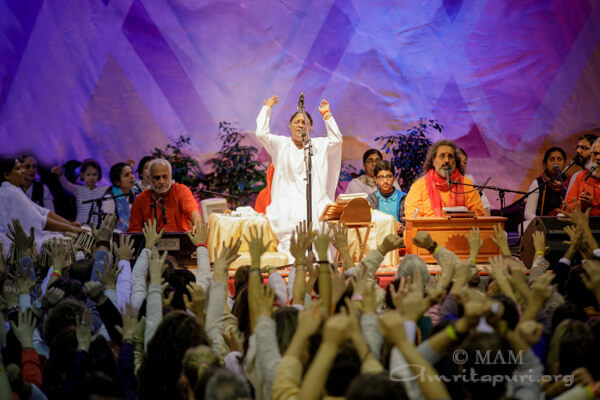 As the song concluded, there was a surge of joy and love in the crowd. 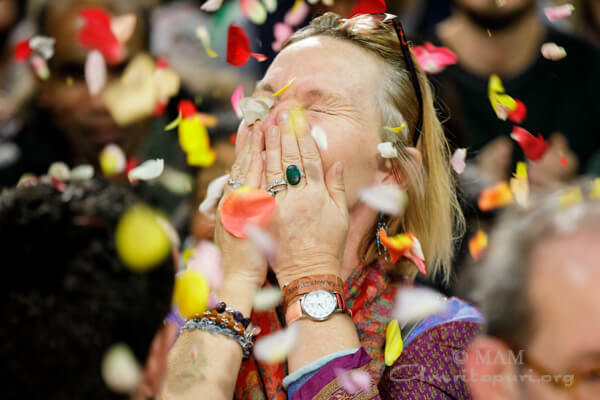 Not only were all cheering and celebrating, but they also tossed hundreds of brightly colored balloons in the air! 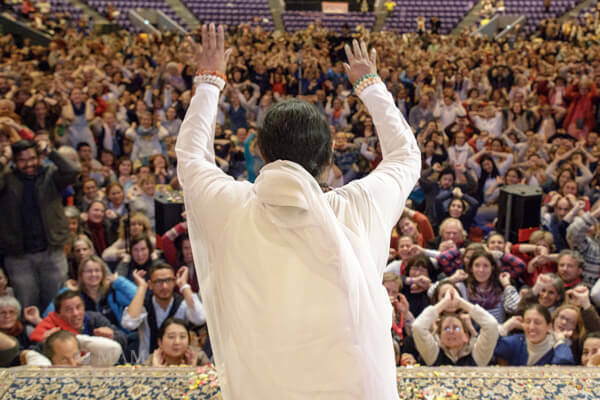 Then, spontaneously, each person stood up until the entire crowd was on their feet, expressing their gratitude for Amma in a standing ovation that lasted nearly ten minutes. 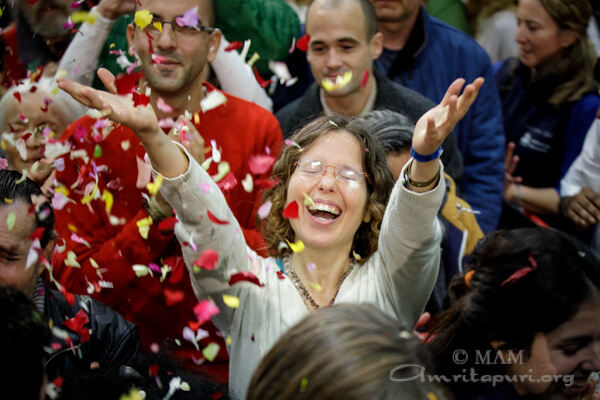 It was a magnificent moment of celebration and the crowd did not show any sign of tiring. 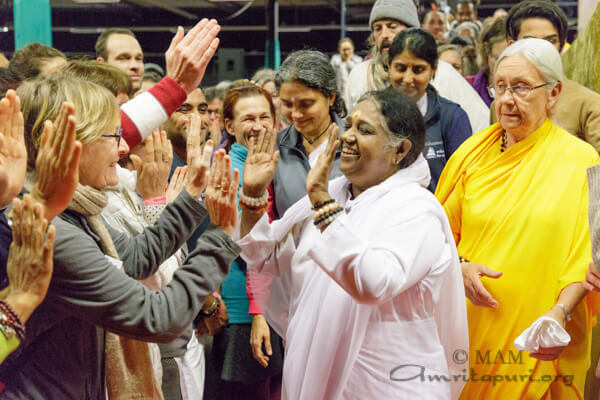 Finally, Amma’s translator had to gently bring the cheering to an end so that Amma’s satsang could begin. 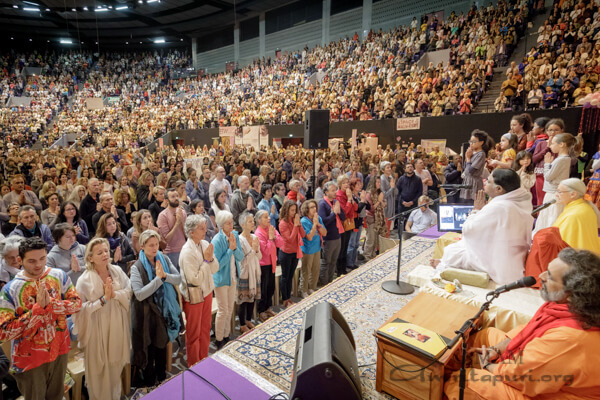 The three days of programs in Chalons-en-Champagne will surely remain etched forever in the hearts of all those who attended. 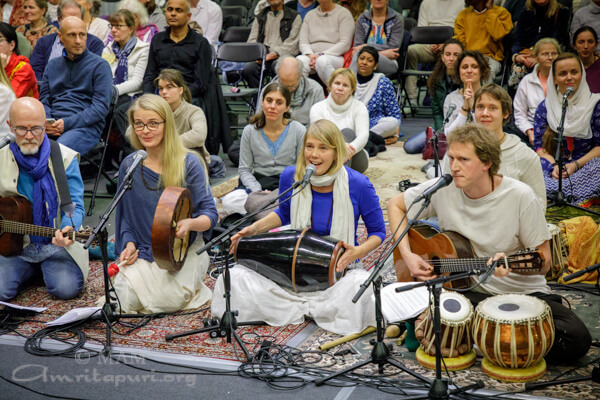 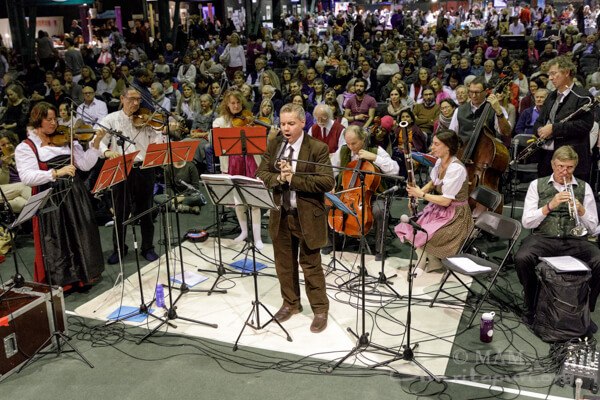 Amma’s programs in Munich are always marked by classical music – some of the musicians belong to Munich’s Philharmonic Orchestra. 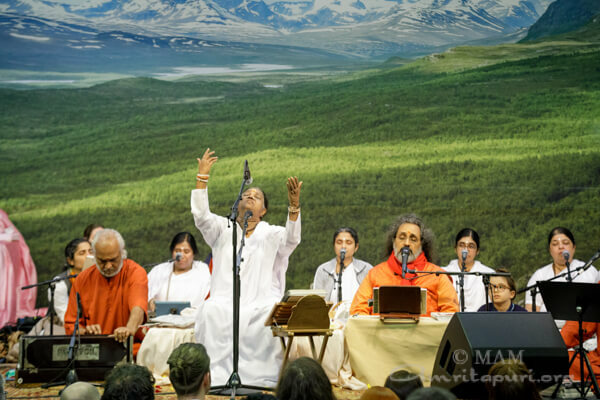 The musicians always make the time to lend their time and talents to Amma’s program, to the delight of all the program attendees. 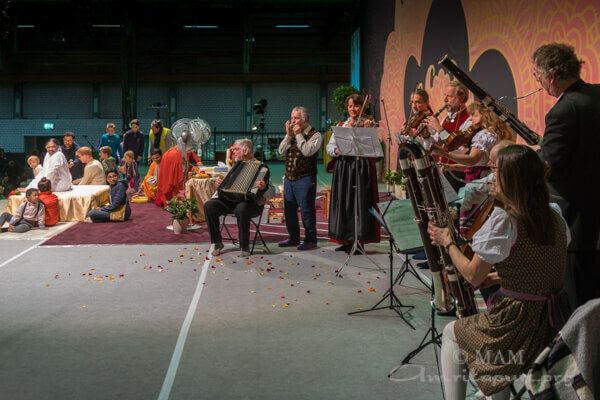 As Amma arrives on the stage, she is welcomed by these musicians, dressed in traditional Bavarian attire. 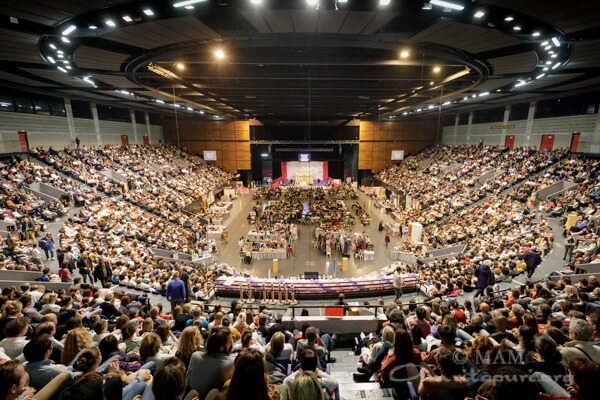 The Zenith Halle where Amma’s program is held was a factory converted into an event space, and Amma’s walk to her room is along a catwalk high on the wall of the main program hall. 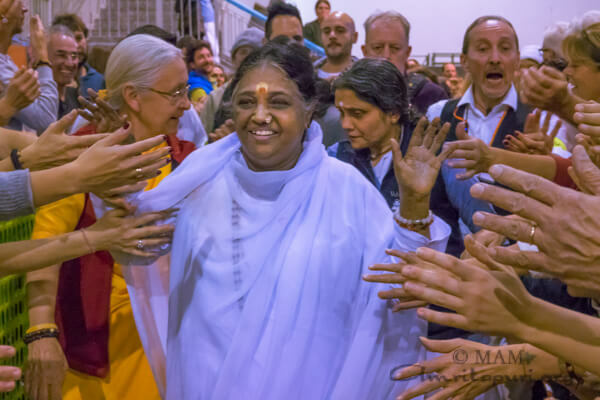 Thus the devotees are treated to the sight of Amma walking, alone and unencumbered by crowds, and Amma takes her time, looking back and down at all the devotees as she makes her way to her room. 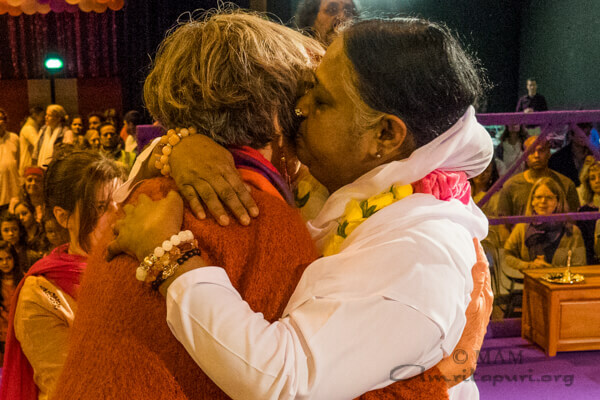 At the end of Amma’s walk, applause and cries of Mata Rani Ki Jai! 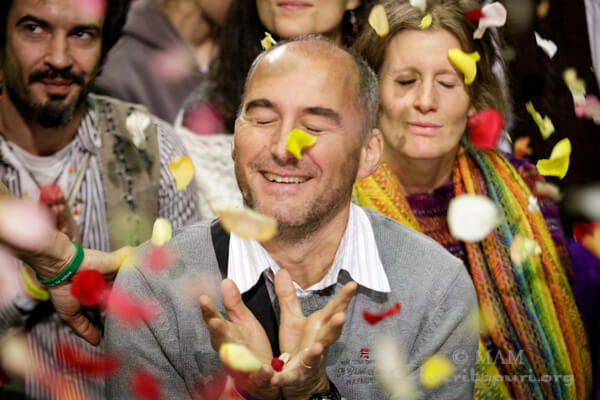 mark the close of the program. 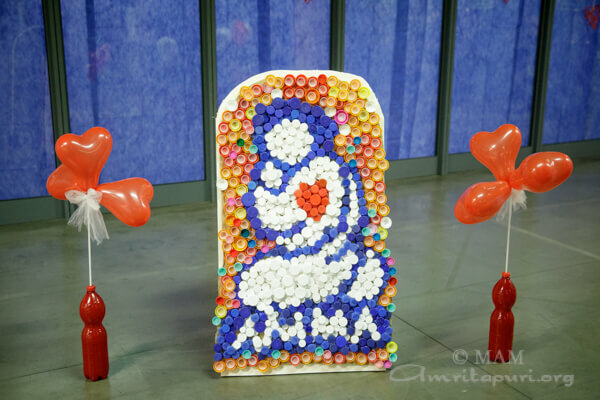 This year, the path along the catwalk was adorned with chocolate hearts inscribed Danke Amma in honor of Amma’s 30th anniversary visit. 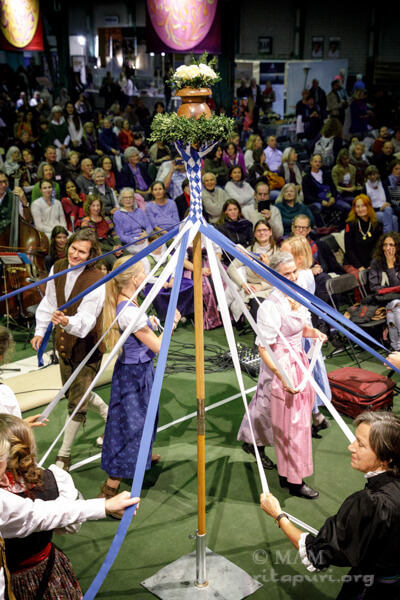 Another highlight of the programs was a traditional Bavarian Maypole dance, in which devotees created beautiful designs with ribbons extended from poles. 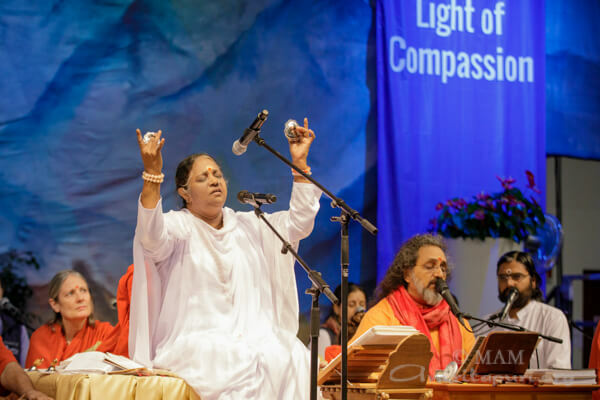 At the close of the celebration of Amma’s 30th visit to Munich, classical musicians led the entire audience in a beautiful rendition of Joy to the World. 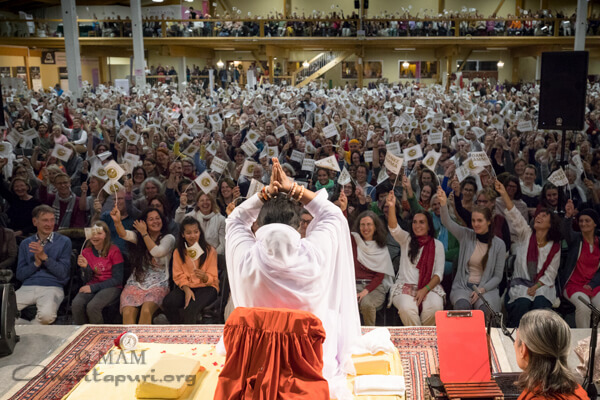 As the crowd intoned, “Joy to the World, Amma has come,” as a special surprise, multi-colored heart-shaped balloons began to descend from the rafters, first 5, then 10, then dozens and scores. 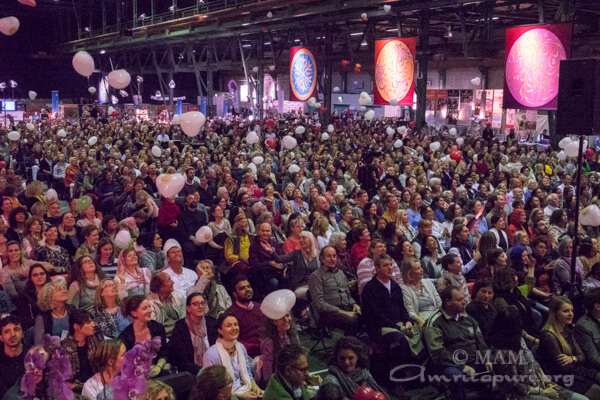 As the balloons reached the crowd below, they began to bat the balloons back into the air, reluctant to let them fall to the ground. 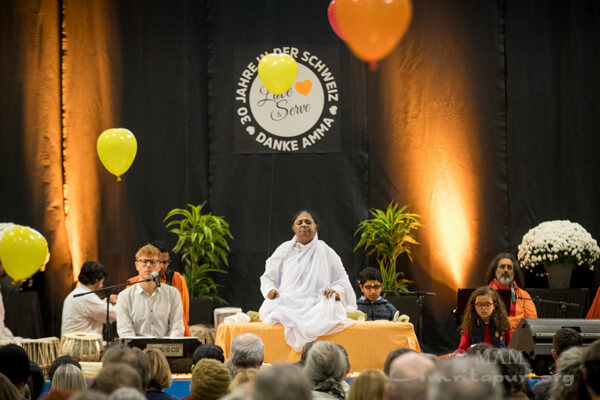 The result was that even as balloons continued to descend, the ones that had fallen would rise back up, forming a beautiful dance of hearts, kept afloat by the attention and care of the devotees below. 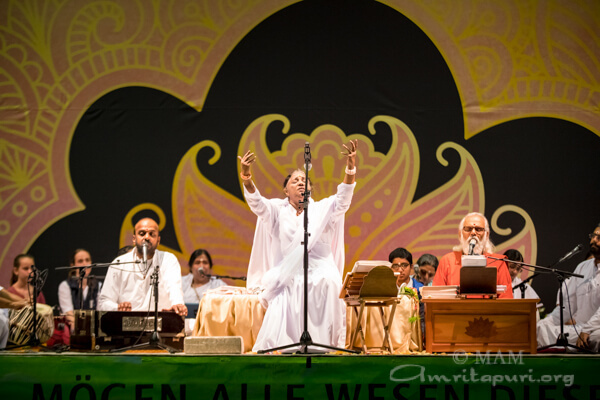 It was a spellbinding display, made all the more poignant by the song that reverberated throughout the hall. 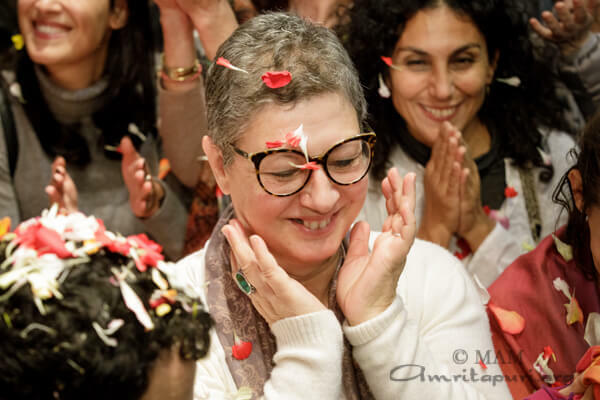 And though it lasted only a few minutes, time seemed to stretch, for it was a scene and moment that would not be soon forgotten – a pearl of love and celebration of compassion that would be imprinted in the hearts of all those who were there. 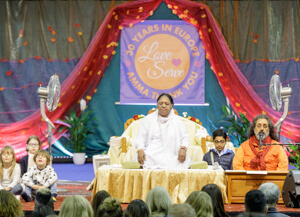 Amma’s visit to London was held at the Sandown Racecourse in Surrey. 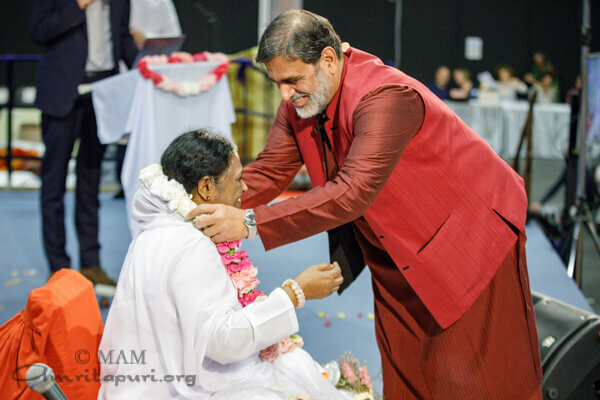 It was Amma’s 30th visit to London, and the occasion was marked by a special ceremony on the first evening of programs. 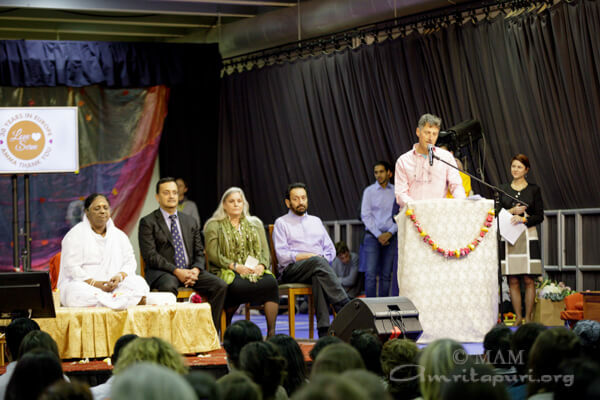 Special guests included Academy-Award winning director Shekhar Kapur and Ambassador Dinesh K. Patnaik, Deputy High Commissioner of India to the United Kingdom, and Maddy Harland, co-founder of the Sustainability Centre in Hampshire, Fellow of the Royal Society of Arts and the Institute of Theological Partnerships at the University of Winchester. 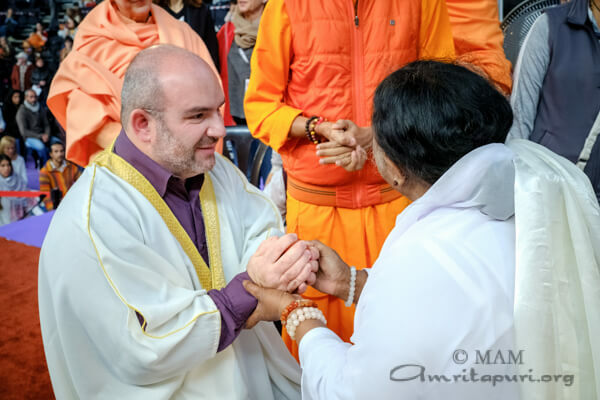 Amma’s 30th visit to London and the United Kingdom was commemorated by Mike Sofroniou, who helped to organize that first visit and every one since then. 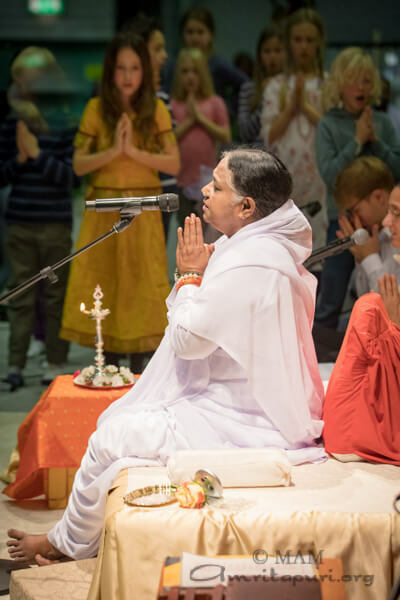 Mike recalled, “In the first year Amma held an evening programme in St James Church in Piccadilly and the sight of Amma singing and calling ecstatically out to the Divine sitting in front of the altar and against the backdrop of the magnificent stained glass window was profoundly moving. 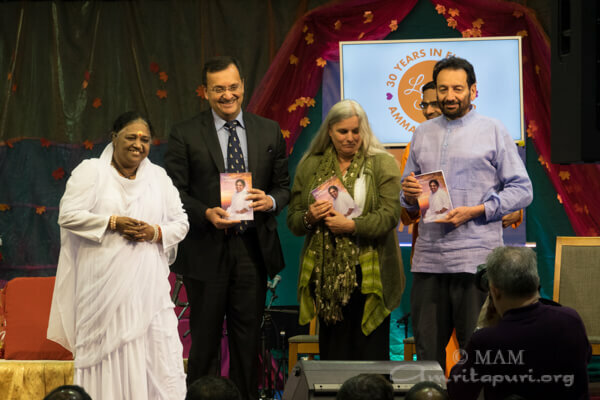 It felt as though Christianity and the ancient spirituality of India had come together in the living person of Amma. 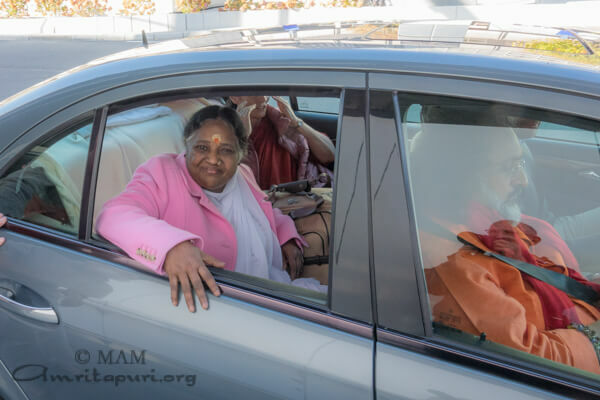 As she gave her loving darshan afterwards she encouraged us to sit around her and sing devotional songs. 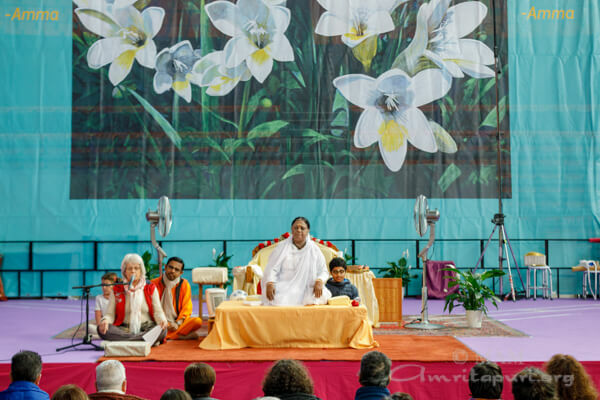 People were astonished and overwhelmed by Amma’s simplicity and accessibility. 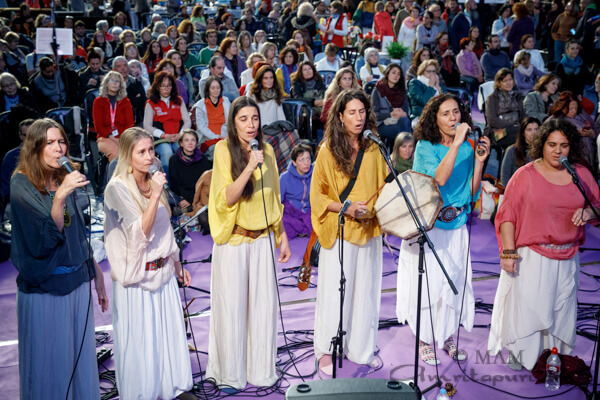 “Then we moved to a small church in Kentish Town in 1989. 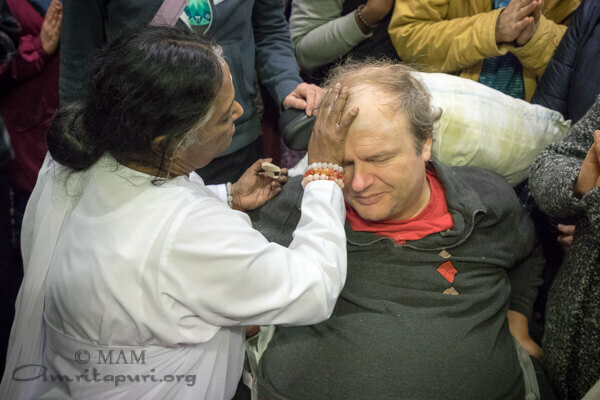 In those days darshan went on until midnight and we wondered how Amma would be able to keep it up. 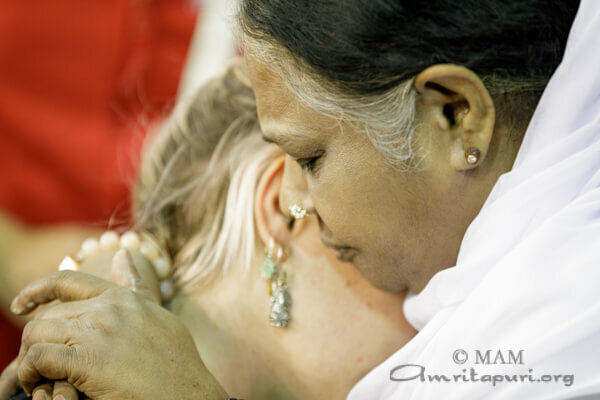 How little did we know Amma and how could we know then that so many years later Amma would sit throughout the night into the morning hours. 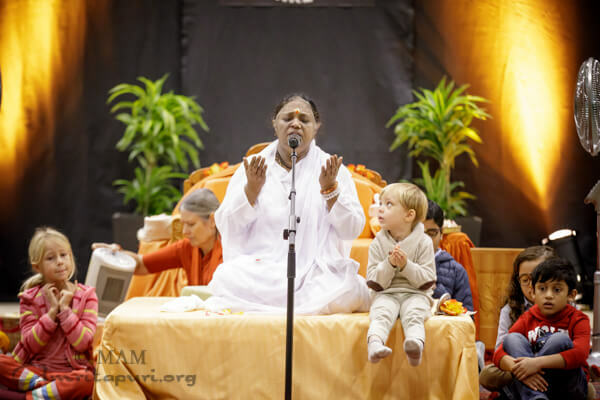 Even when all night darshan continued until 5 or 6 am and Amma had embraced people throughout the night when we were short of volunteers Amma would help with the clear up at the end of the programme, cleaning and helping dismantle the stage decorations. 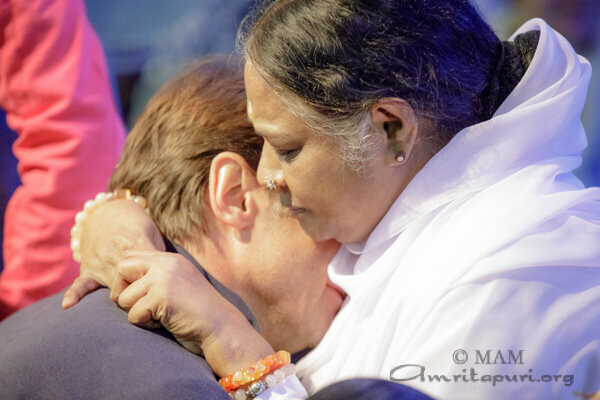 This was an act of compassion towards us and a wonderful example to every one of service and utter selflessness. 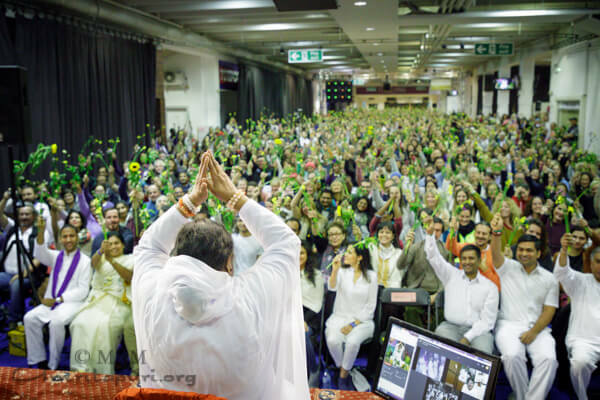 The UK chapter of Amma’s environmental movement, GreenFriends, had pledged to plant 1,000 trees on a year earlier, on the occasion of Amma’s 29th visit to London. 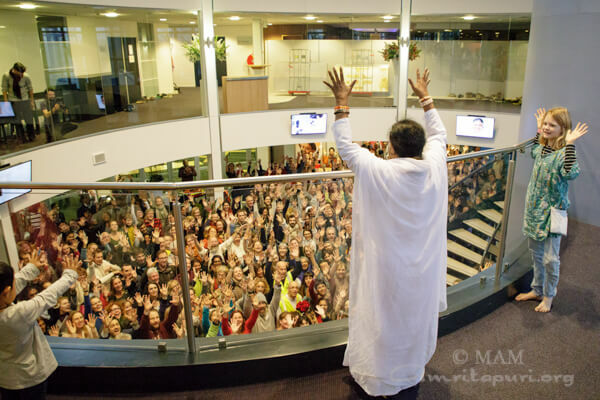 One year later, they were pleased to announce that they had surpassed their pledge, having planted 1,684 trees in various parts of the UK. 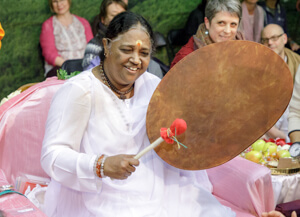 They also announced that an acre of Woodland within the proposed World Heritage Site known as Darwin at Downe would be christened Amma’s Wood, in recognition of GreenFriends’ commitment to planting trees in the United Kingdom. 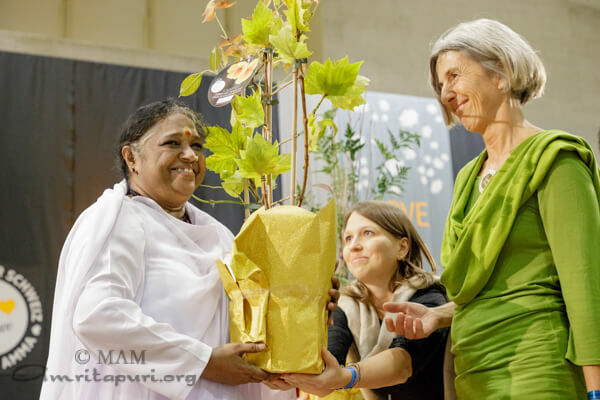 Amma honoured and recognized this effort, giving saplings to three generations of devotees as part of the 30th anniversary celebrations. 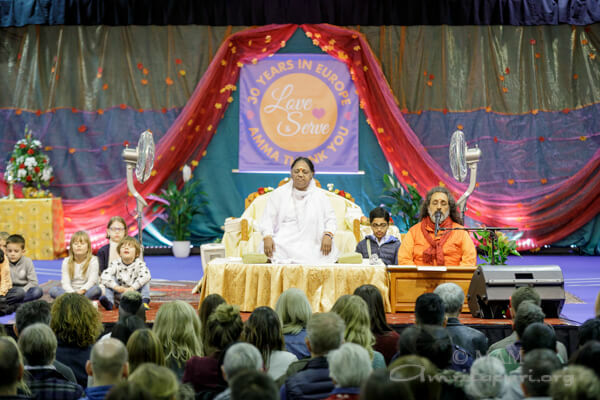 The devotees of the UK also had a surprise for Amma – at the close of the 30th year celebrations, each of the thousands of people in attendance held up a yellow British wildflower, waving it gently in the air, creating a vision and feeling of a massive, peaceful valley of flowers, gently blown by the winds of divine grace of love. 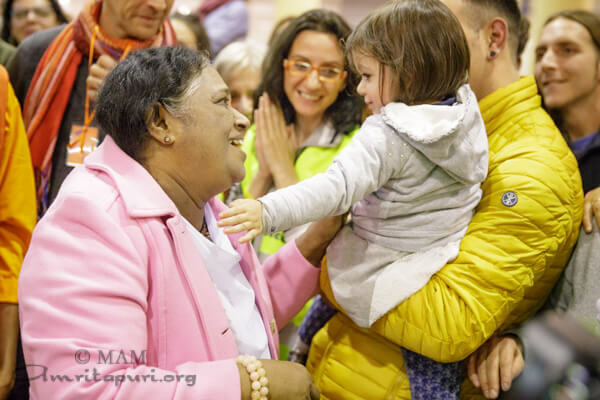 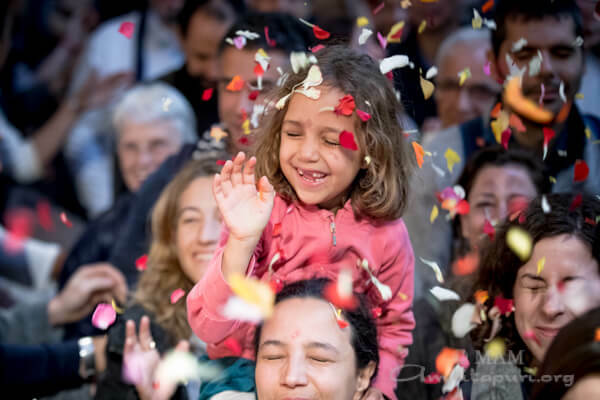 Though Amma’s programs were held on weekdays (Monday, Tuesday, Wednesday), the MalpensaFiere program hall in Busto Arsizio was overflowing with devotees and newcomers who wanted to experience a few moments in Amma’s arms. 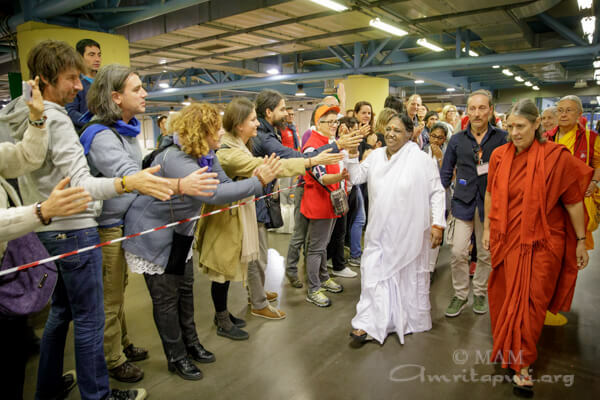 The hall also overflowed with a classic Italian enthusiasm – the room reverberated with cries of Benvenuto Amma!! 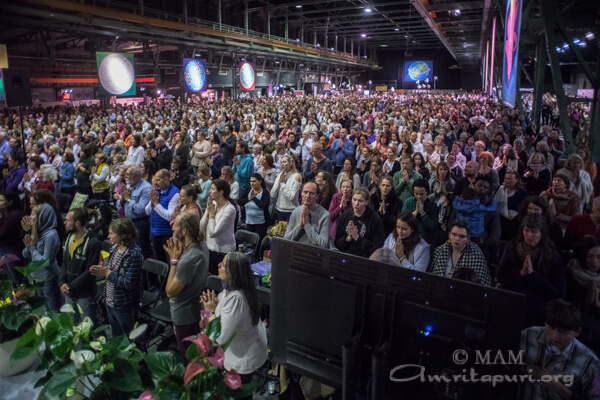 as Amma first arrived, and at the close of each program, the room erupted in applause. 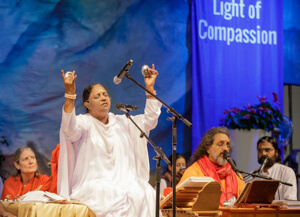 The stage backdrop, created with the theme Light of Compassion, glowed magically behind Amma. 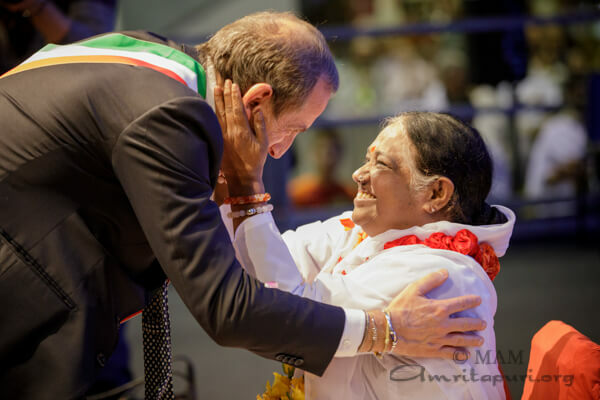 Mr. Pradeep Gautam, Consul of Indian Consulate in Milano also garlanded Amma and welcomed her to Italy. 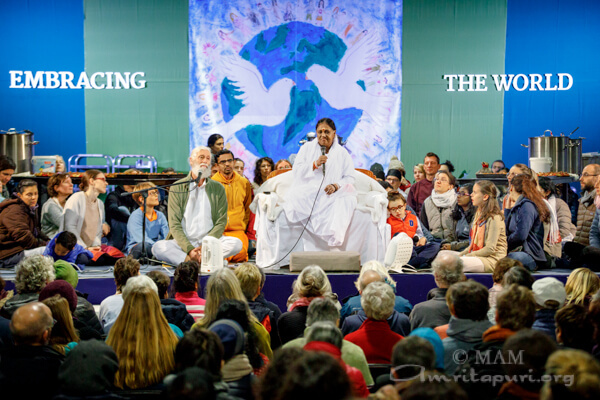 There was a very special performance of singing glasses or musical wine glasses by a devotee. 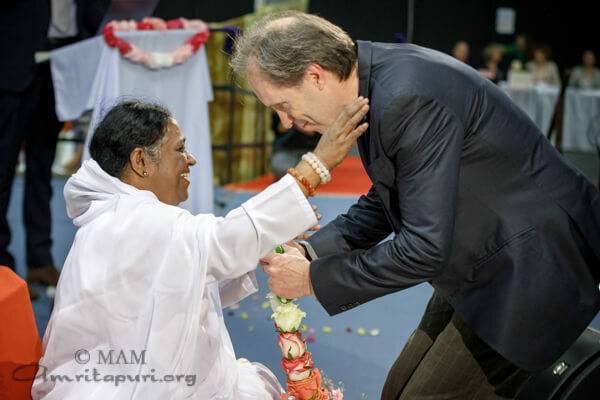 As Amma walked from the program hall to her room on the other side of MalpensaFiere, her path was lined by devotees, morning and night. 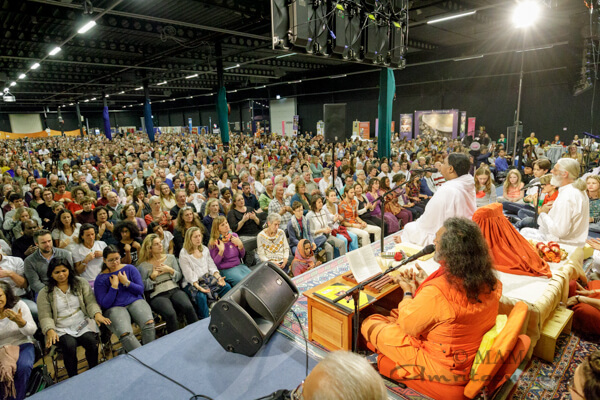 On Thursday morning, at the close of the all night Devi Bhava darshan, the program hall was nearly as packed as it had been the night before, as almost all the devotees chose this celebration of love over a night of sleep. 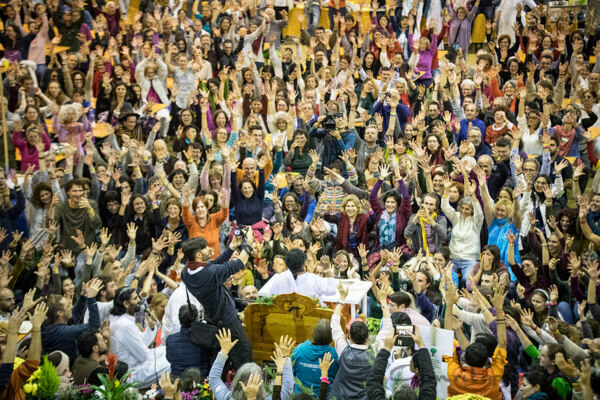 This choice, made by so many in unison, gave hope that the love that pervaded that night in Milano would be carried forward into the lives of all those who were there, and by extension into the lives of all whose paths intersected with theirs — that ultimately, humanity as a whole, facing darkness and ignorance, would turn away, and choose light and love. 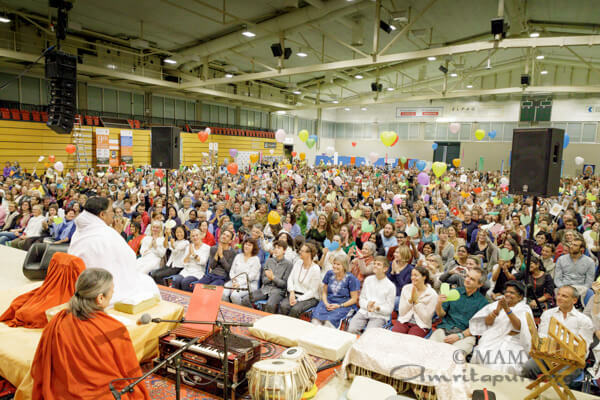 When Amma arrived to the venue, she was greeted with the traditional Swiss horn alphorn as hundreds of volunteers gathered to receive Amma. 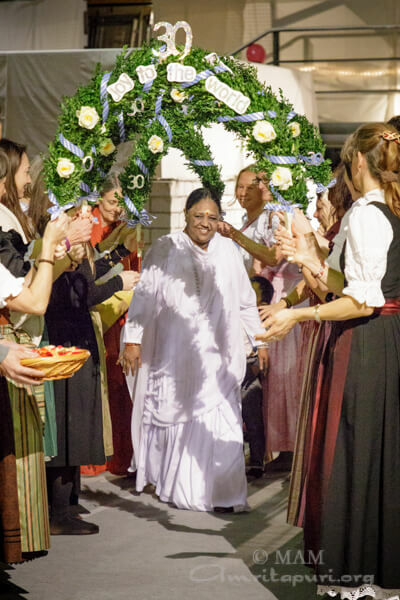 Also as part of the celebration, people from all four regions of Switzerland dressed in their traditional attire, presented Amma with gifts of food items particular to their region, as a symbol of the entire country coming together to welcome and honor Amma and her message of love and compassion. 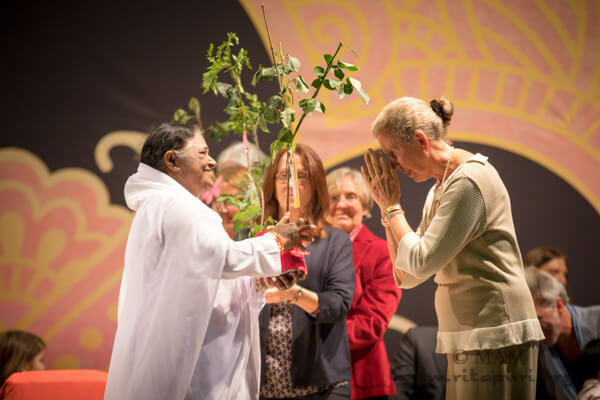 At the close of the ceremony, Amma presented saplings to three generations of devotees – those who met Amma when she first came to Switzerland, their children, and their children’s children. 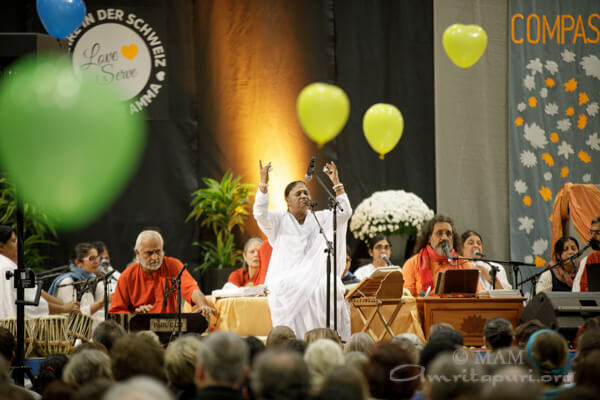 Finally, devotees throughout the audience raised flags and allowed heart-shaped balloons to rise into the air, creating a beautiful spectacle of love and appreciation for Amma’s three decades of visiting Switzerland. 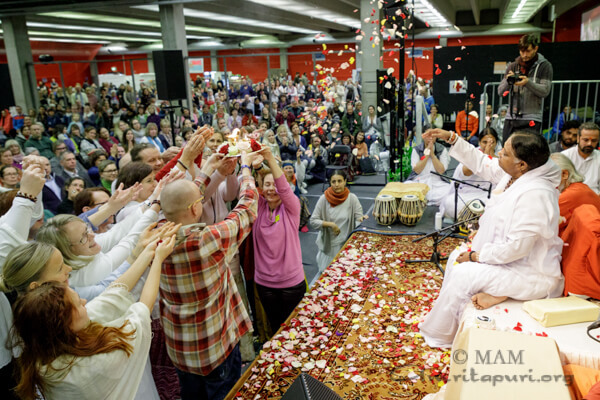 Fittingly, Amma’s two days of programs in Winterthur saw larger crowds than ever before, even through the night to the end of Devi Bhava, when countless people who had stayed through the night to spend every last moment in Amma’s presence, passed in front of Amma as she showered flowers on each one of them, worshipping the divinity in one and all – for this is where Amma sees God: in each and every person who comes to her. 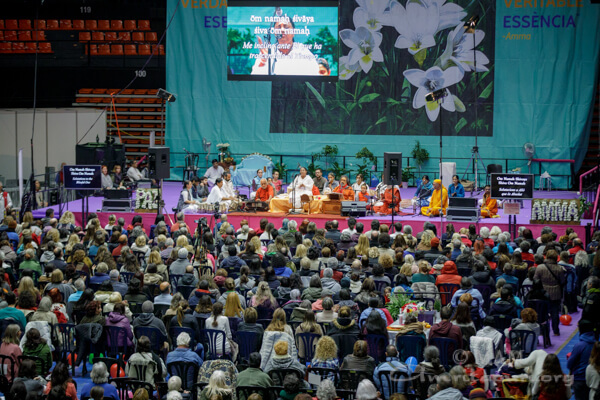 Attendees to Amma’s programs at the Zenith Omega stadium in Toulon, Southern France once again packed the arena for three days straight. 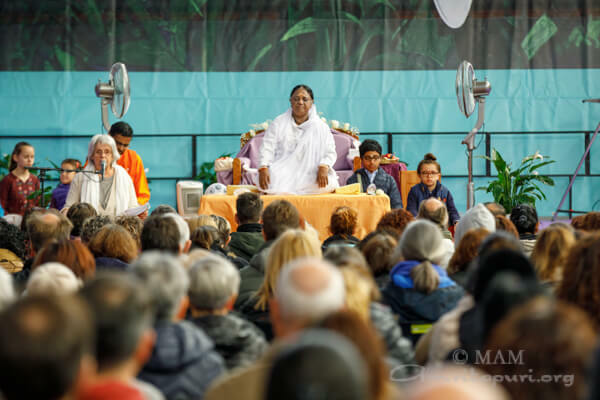 There was a special ceremony in celebration of Amma’s 30th anniversary of visiting Europe, and 20th anniversary of visiting Southern France. 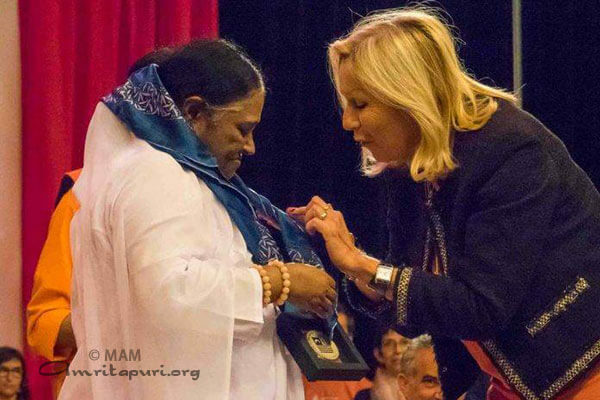 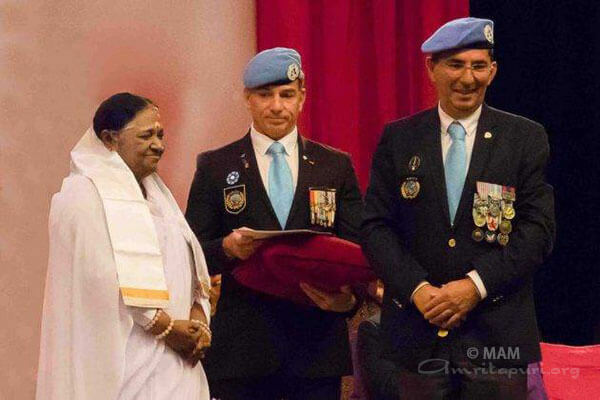 During the ceremony, Amma was presented with two awards for her lifetime of work as a spiritual leader and humanitarian. 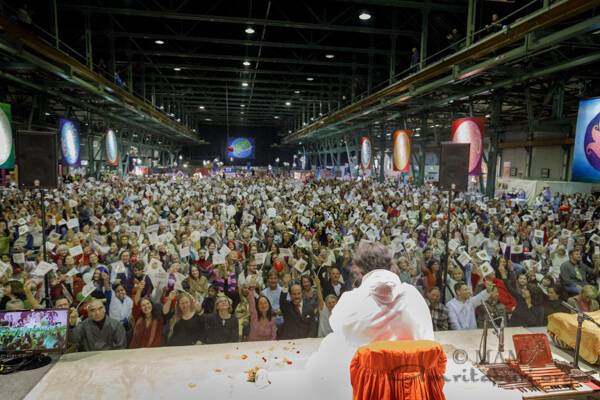 At the close of the 30th anniversary celebration, a special surprise awaited – the entire arena stood and waved paper hearts in the air, while at the rear of the arena, directly in front of Amma, more than 1,000 people, holding white and red sheets of paper in perfect coordination, stood up and transformed themselves into a massive heart, red against a white background. 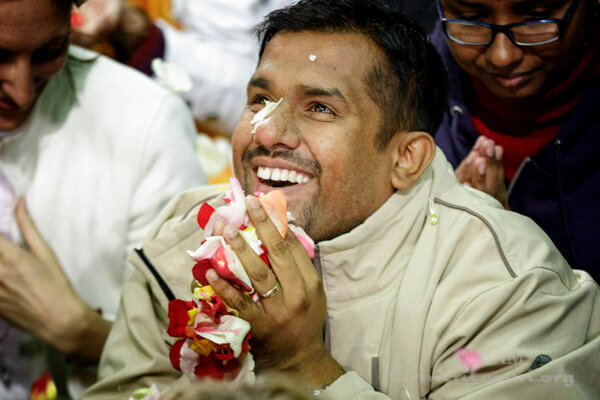 Another special moment during the programs came in the form of a cake. 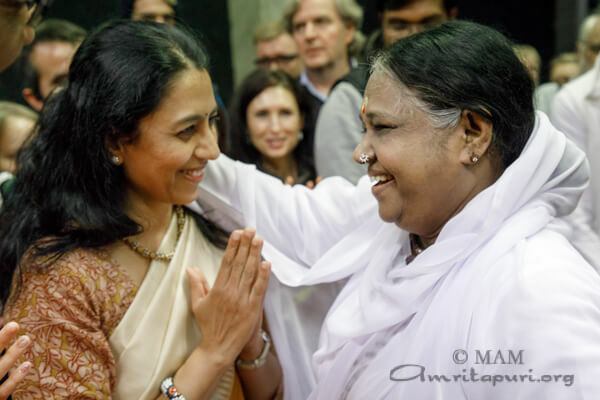 Three years ago, Amma blessed a project to build Promise House, a drop-in center for teenage girls facing difficulties in their lives. 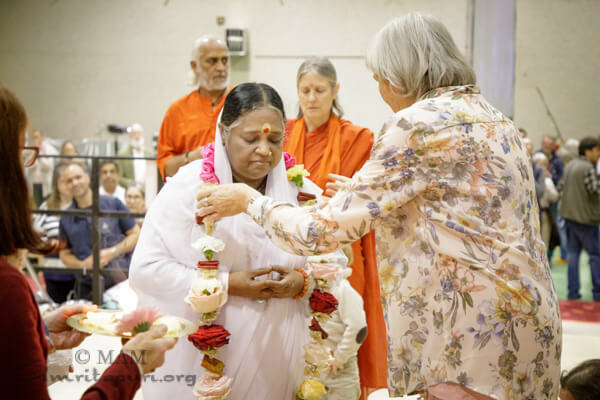 This year, the devotees who had established the new center brought Amma a cake topped by a rose-shaped jewelry case. 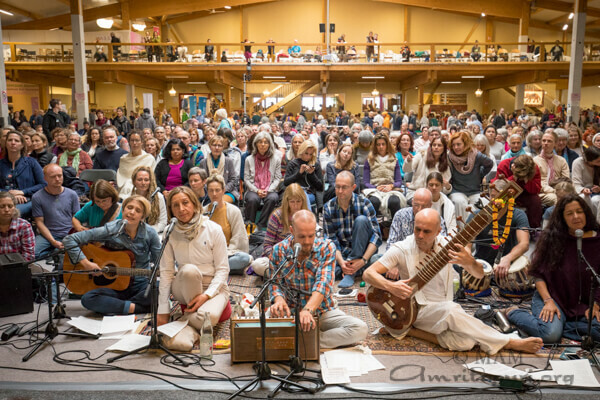 Inside the case was the key to the new Promise House, as the center is about to open its doors. 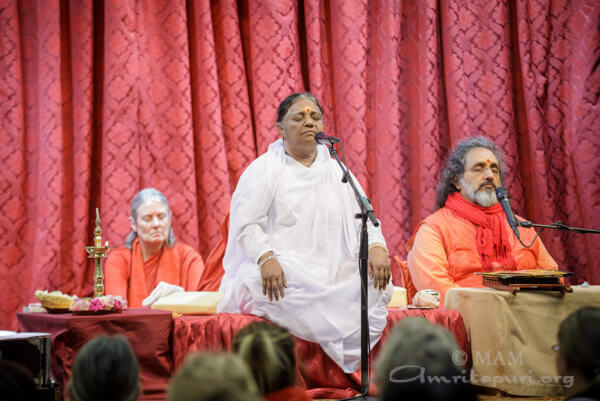 And thus Amma’s love finds its way, like a winding river, into the lives of those who have never even heard her name. 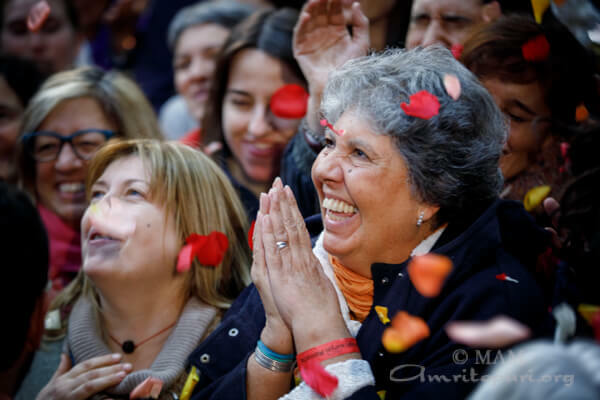 For 30 years now, this river has been flowing, watering the hearts and minds of all who cross its path, and many never set foot in it, yet are touched by those who did. 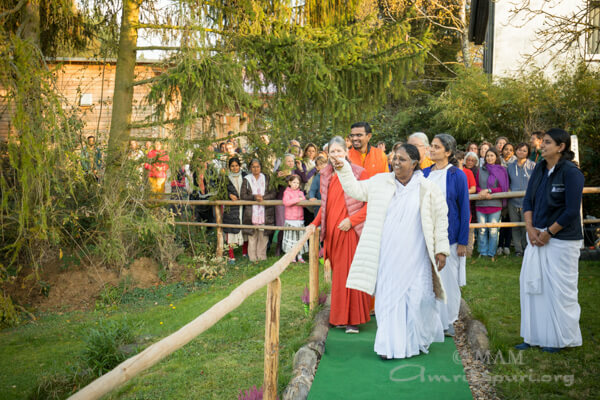 The 2017 Europe Tour started with Amma’s 3-day program at her center in Hof Herrenberg, Brombachtal, Germany. 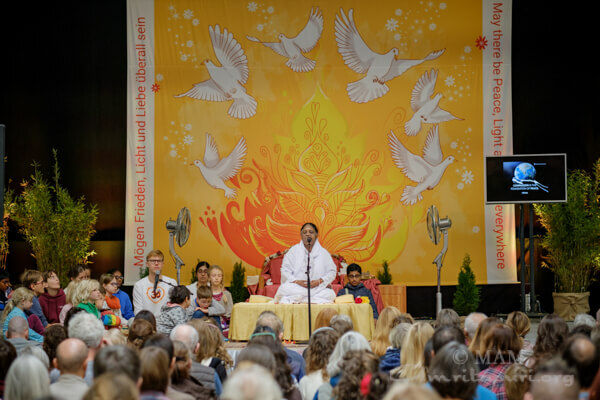 This is the 30th consecutive year that Amma has visited Germany. 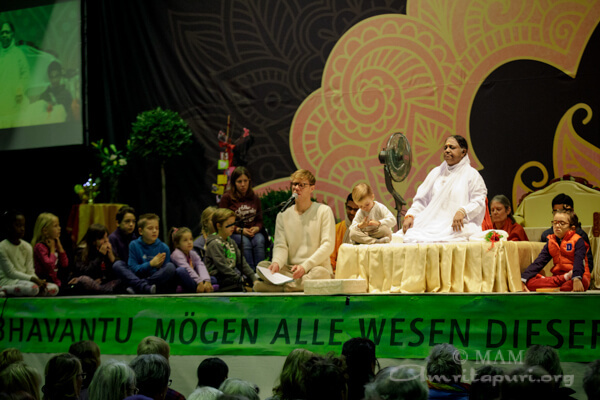 Amma’s children from different parts of Germany and all over Europe flocked to Brombachtal to participate in the tour’s inaugural program. 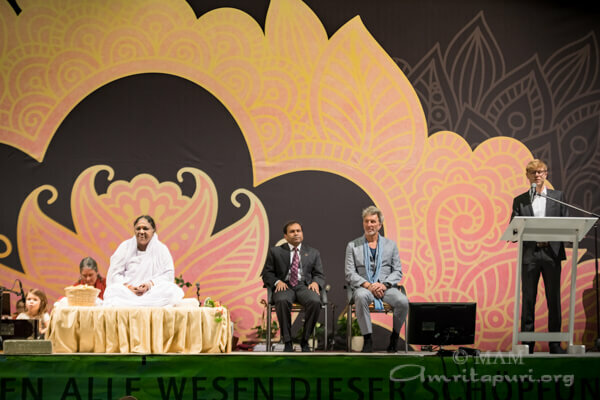 Amma was welcomed to Germany by Mr. Willie Kredel, Mayor of Brombachtal and Mr. Stefan Kelbert, Mayor of Michelstadt as part of a ceremony celebrating Amma’s 30th visit to Germany. 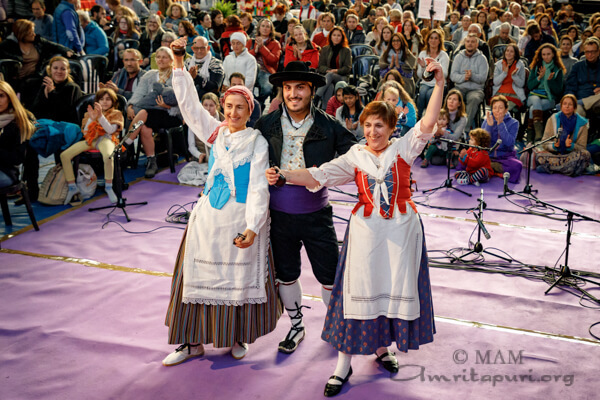 Mayor Kelbert shared his own feelings about having Amma visit their community each year: “I am happy to be a part of this world, both on behalf of the city of Michelstadt and personally. 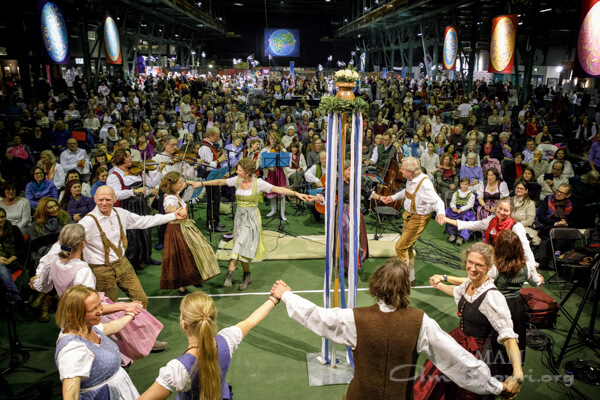 Even though we are standing on stage right now, we feel like we are a part of all of you. 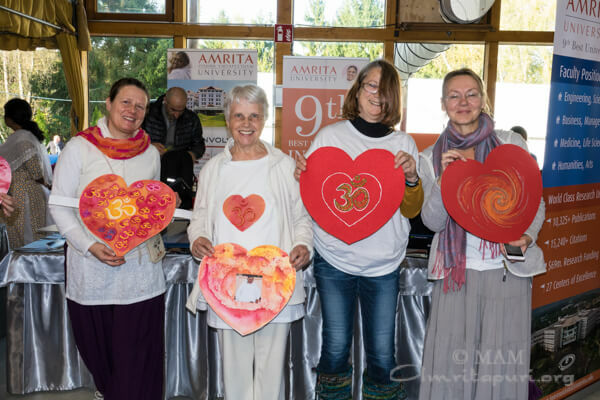 Moi Leevke Wolfsteller, the chairperson of Amma’s charitable organization in Germany, gave a moving speech commemorating Amma’s anniversary visit: “It all started 30 years ago, and I remember it like it was yesterday. 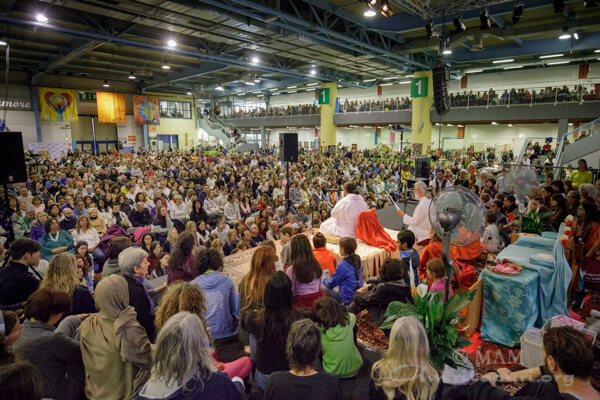 In those days, Amma’s programs did not take place in halls like this one, but in living rooms of people who admired Amma, in yoga studios, doctors’ offices, local community centers. 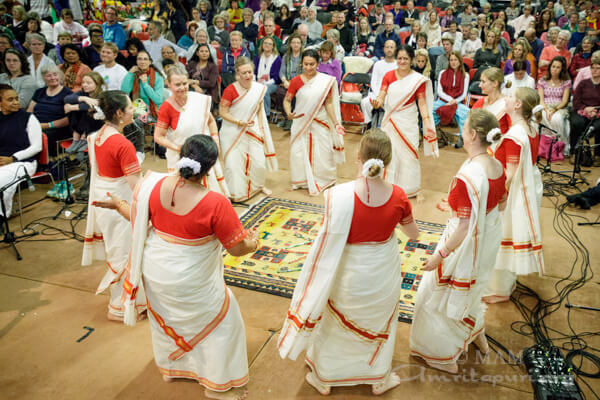 We used to rent class rooms in schools. 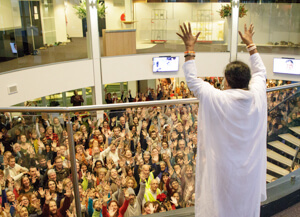 Since then, the halls got bigger and the crowds grew more and more. 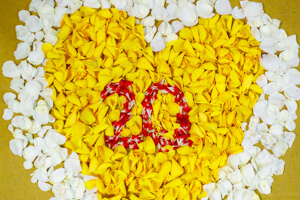 So much change. 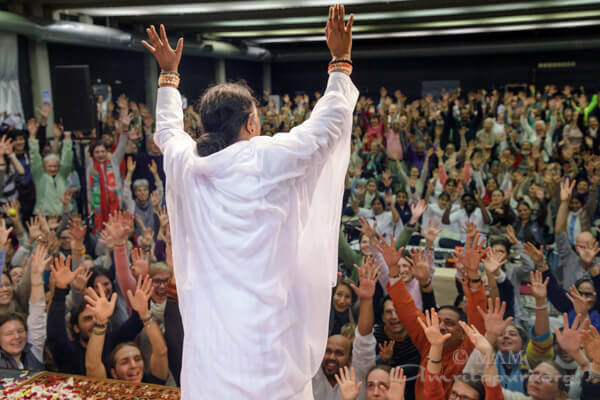 So much growth. 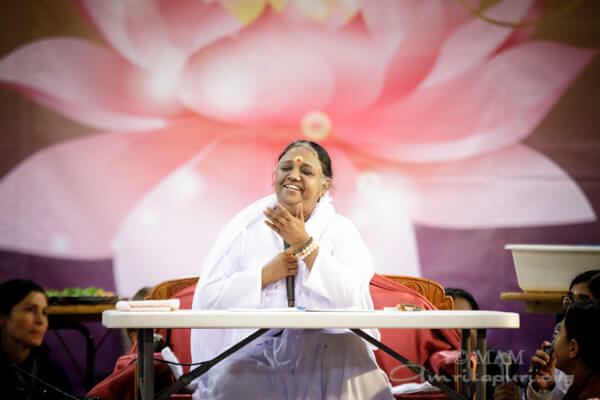 The only factor that has remained unchanged is our Amma. 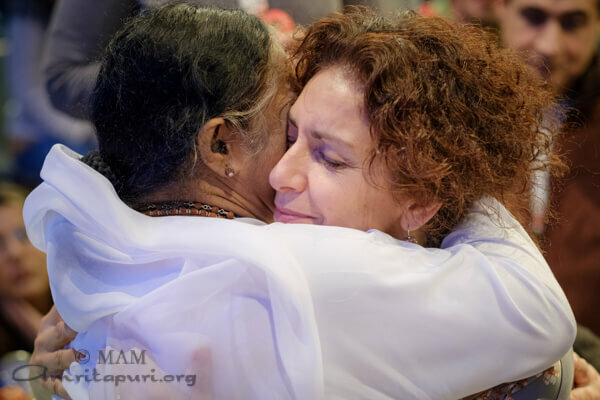 Her limitless love and her limitless compassion flow continuously towards us, over and over and over again. 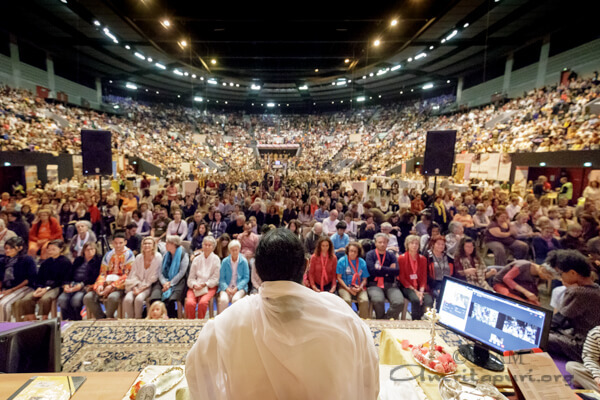 Regardless of whether it is 35 or 3,500 people. 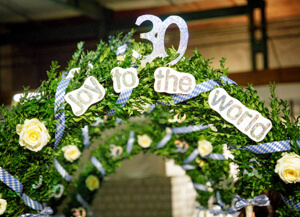 For 30 years, we have been recipients of this unbelievable love. 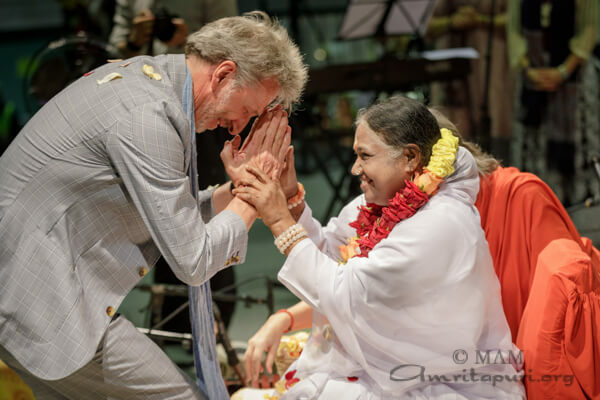 We cannot find the right words for this beautiful gift that Amma has been giving us without a break for such a long time. 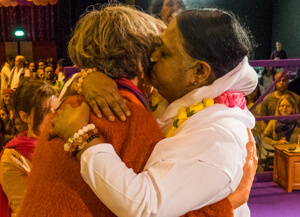 There are no words for this. 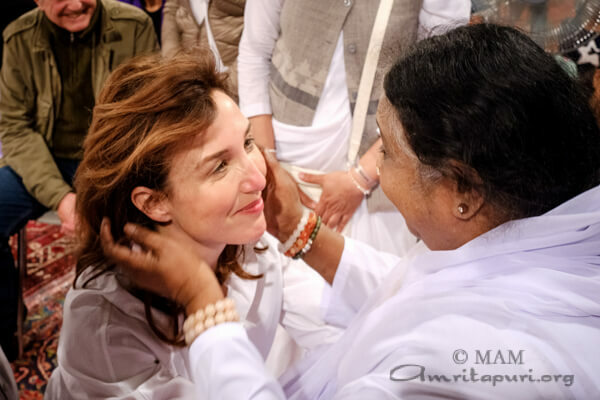 How can we thank Amma for returning again and again? 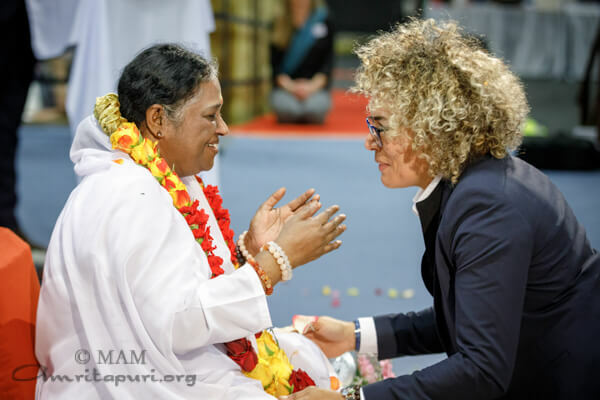 It is Amma’s wish that we integrate the spiritual values that she talks about and that she exemplifies, into our own lives. 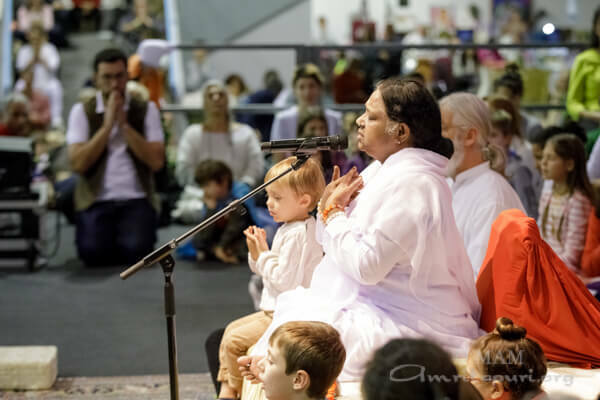 If we become more loving and more selfless in our thoughts, more caring and sensitive in our words, more compassionate and humble in our actions, both towards ourselves and towards others, that is our thanks to Amma. 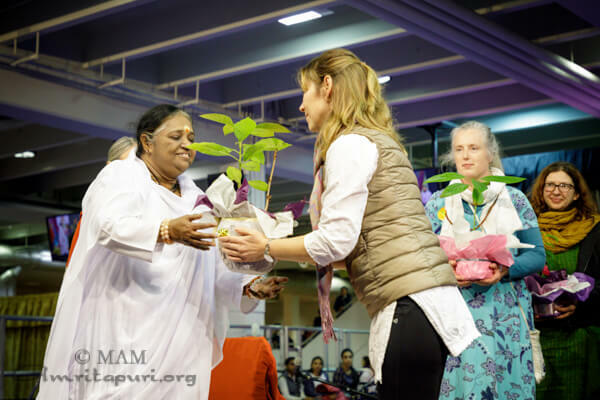 On this occasion, Amma handed over oak saplings to the residents of M.A. 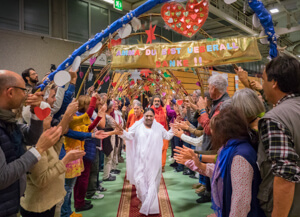 Center in Brombachtal. 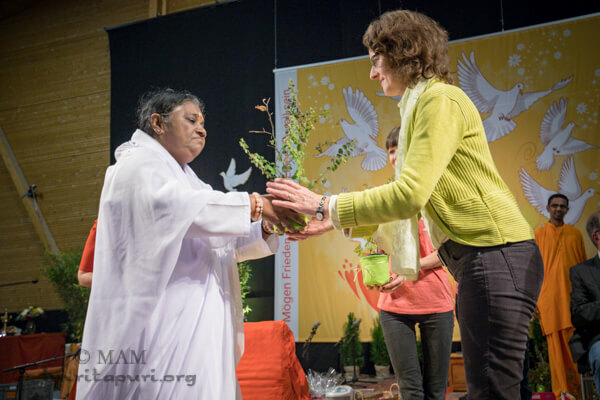 The trees will be planted on the property of the center in memory of this momentous and sacred occasion. 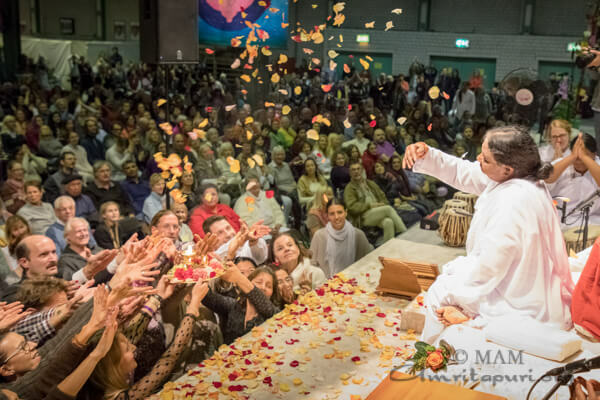 AYUDH presented Amma with a garland of seeds enclosed in beautiful heart-shaped papers, each one inscribed with a prayer for world peace. 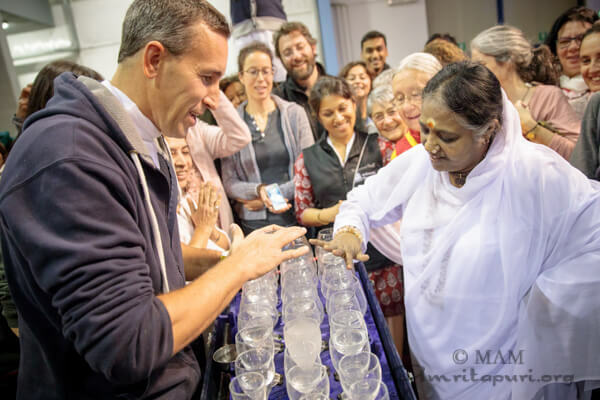 The papers can be planted directly into the ground to grow into beautiful trees, living symbols of the love and light that Amma has inscribed into the hearts of each of these children that have grown up under her wing. 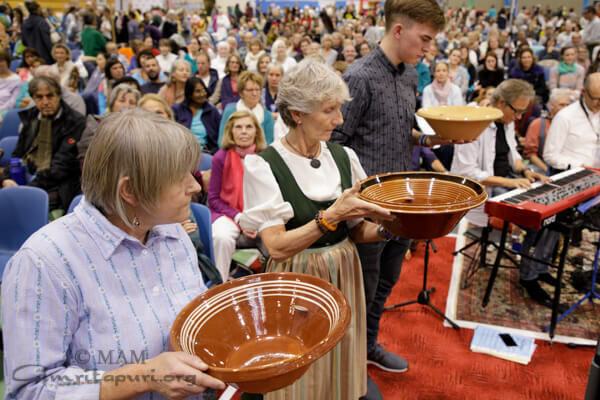 The program ended with a surprise – each person at the program – thousands of Amma’s children, all stood and waved flags reading Danke Amma – forming a beautiful tapestry of gratitude and joy.